In 2010, the Ruhr area was the Cultural Capital of Europe, a title which is given to two European cities each year by the EU. 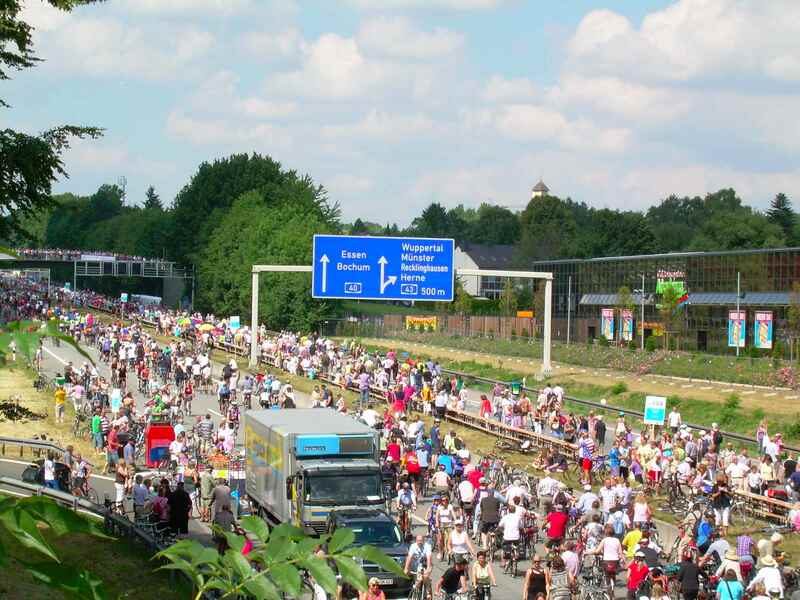 The Ruhr organizers had some brilliant ideas, including having a culture festival on a motorway. 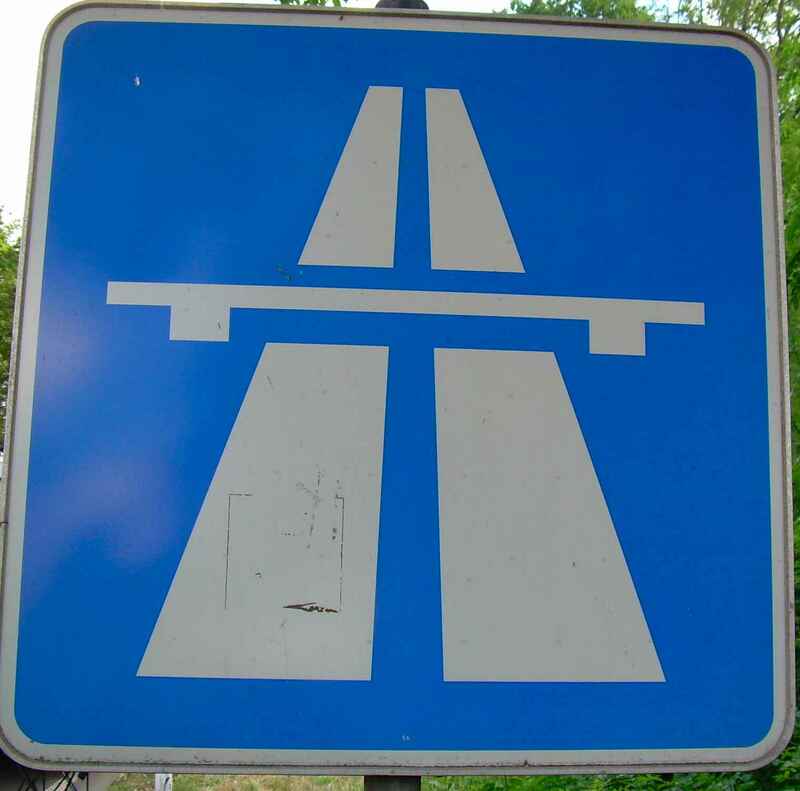 The A40, one of Germany´s busiest highways, was chosen, closed for a day, and given over to visitors. Two lanes in one direction were dedicated to cultural groups like bands, small theatre companies, jugglers, clowns, even neighbourhoods partying, and the other two lanes in the opposite direction were handed over to cyclists. 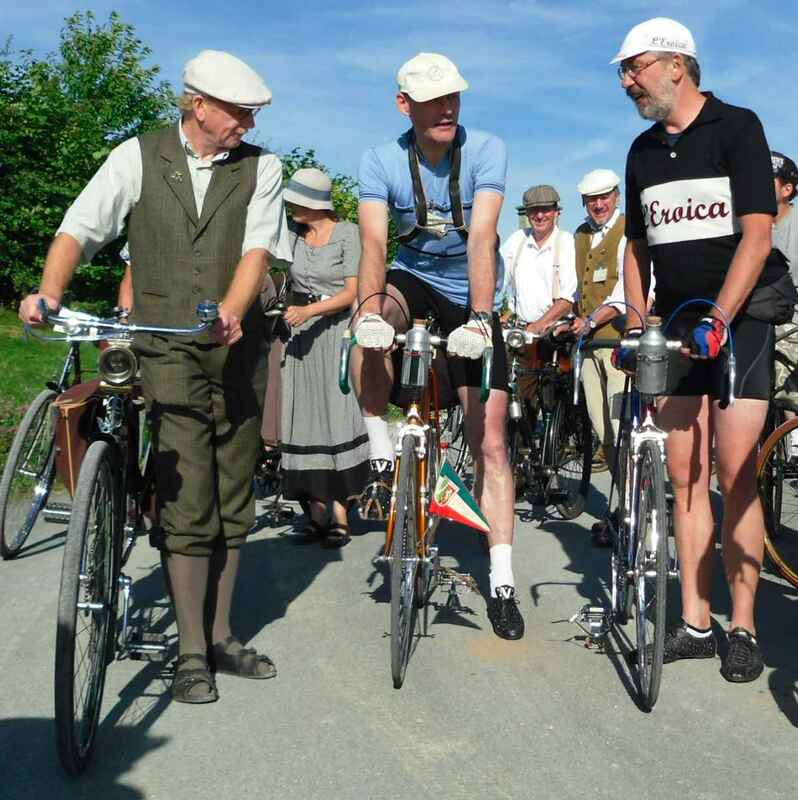 Cyclists from all over Germany were attracted to this event. Trains to and from Dortmund were choc a bloc with bicycles, we were nearly not let on at Herford station, and bikes were literally piled ceiling high. Once in Dortmund we met some friends who are local and who showed us the way. on our bikes, you can imagine that we were a little apprehensive. However, Police, the Fire Brigade and even civil protection people had been posted everywhere, and we really were safe to cycle on the motorway. Riding up the interchange, we felt at once that there was a very special atmosphere among the cyclists. 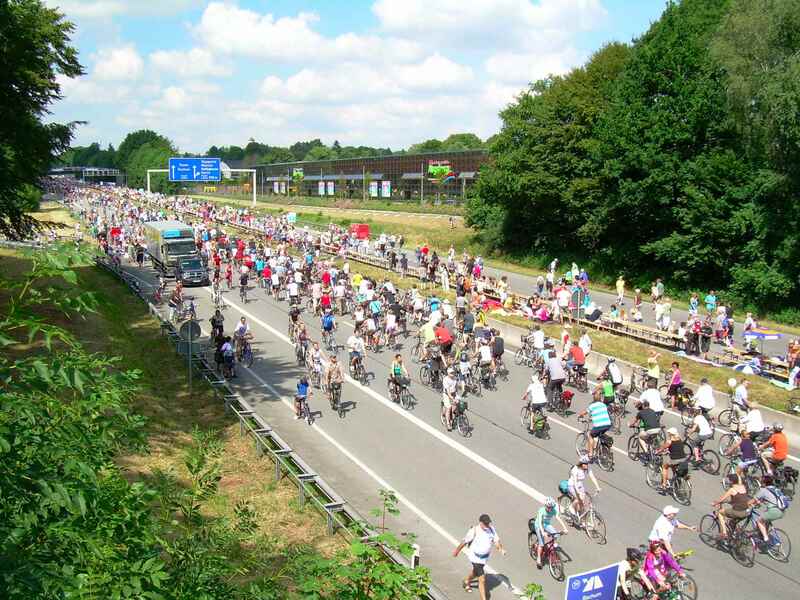 The weather was wonderful, and it seemed everyone joined the fun, even officials and one of Germany´s biggest food store chains which had sent lorries full of drinks and basic snacks. The victuals were sold at normal shop prices which is rare in mass events. In the heat many people were very grateful for a drink. At first, the going was good. 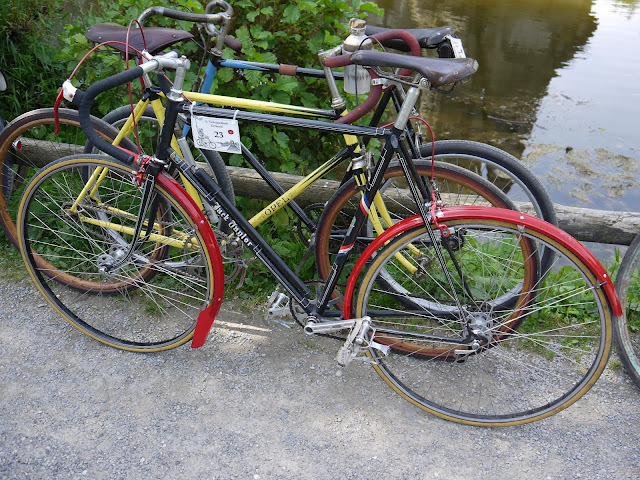 All sorts of bikes were to be seen, even a high wheeler, so of course the faster cyclists had to be very careful. Soon the road was crammed with cyclists and sadly had to be closed for new arrivals. My son (who BTW took the photos in this post) climbed a bridge twice within, say, an hour to take two snaps of the growing density of the crowd. First people took breaks in laybys or on the grass right in the middle of interchanges. Then, some started to climb over the central partition because the throng had become stationary and there was no other way out but to push the bikes along the stalls on the “cultural” half of the motorway. We left at an exit far away from where we had planned to, but the Ruhr being densely populated there were smaller roads everywhere and we made our way back to Dortmund without a problem. So what had people made to come to the Ruhr from all over? I think many had this feeling of re-conquering the freedom to use the public highway, any public highway, if only for a few hours, that was theirs of rights, and historically seen had been theirs for a long time until the arrival of mass motorization. It also was the idea that maybe cycling on a road which normally is a death zone for any non-motorized traffic might be an adventure that is not soon to be repeated. 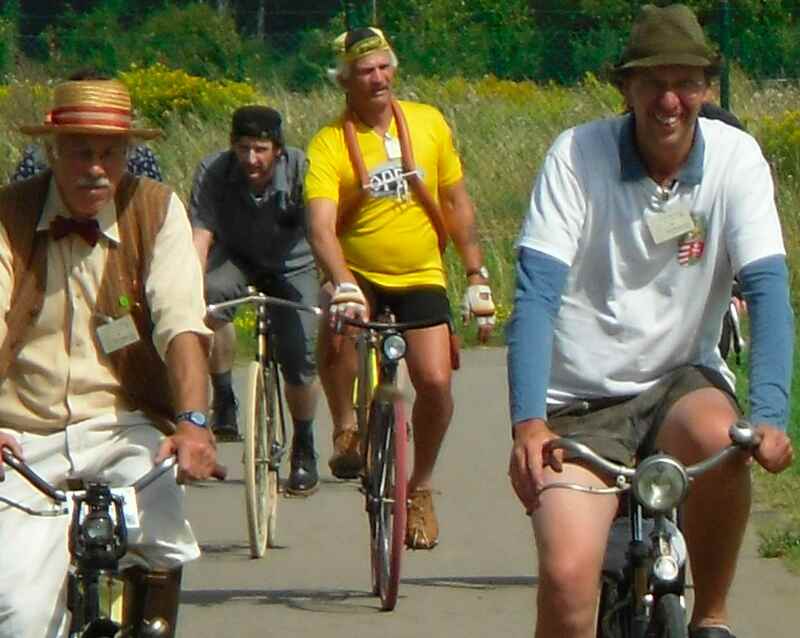 This year´s big German veteran cycle collectors´ and riders´ meet took place in Detmold from Friday 17 Aug until the Sunday. 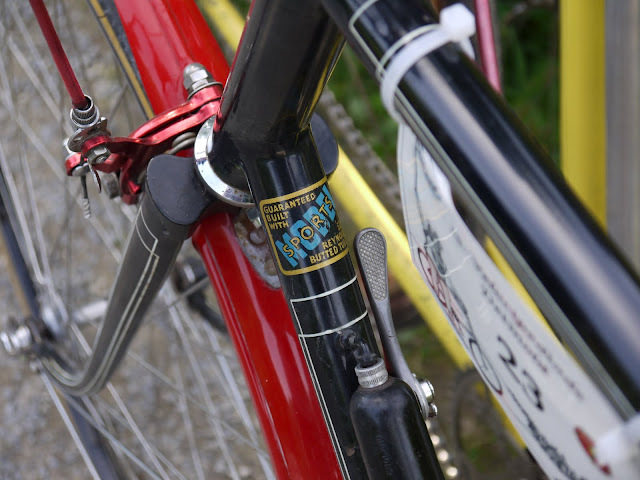 On Friday there was a big cyclejumble, an auction of high class items and afterwards a big cyclejumble. The Saturday started with a big cyclejumble, carried on with a ride, some races on historic bikes, and finished with a festive dinner, and doubtlessly a big cyclejumble. 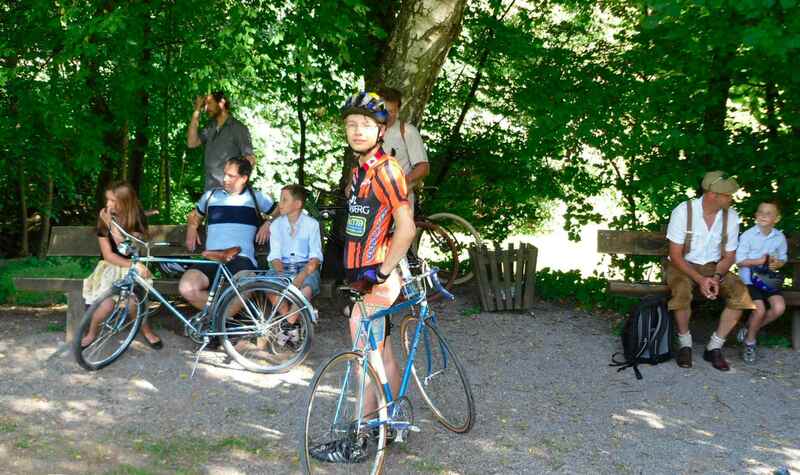 Sunday I guess must have been the same, only the races and the ride were replaced by the organizing club´s AGM. I was there only on the Saturday for the ride together with my son and Oscar Casander who also took some of the photos in this post. They are marked “(O)”. The meet took place in the huge LWL open air museum displaying historic buildings from the area. The organizers had found a fantastic venue in it, and in general must be thanked for a super job. All the participants I met thought likewise. We all felt very well looked after and were made very welcome indeed. The weather was absolutely marvellous, if perhaps a little on the hot side, but after this and last year´s washout summers nobody minded that. 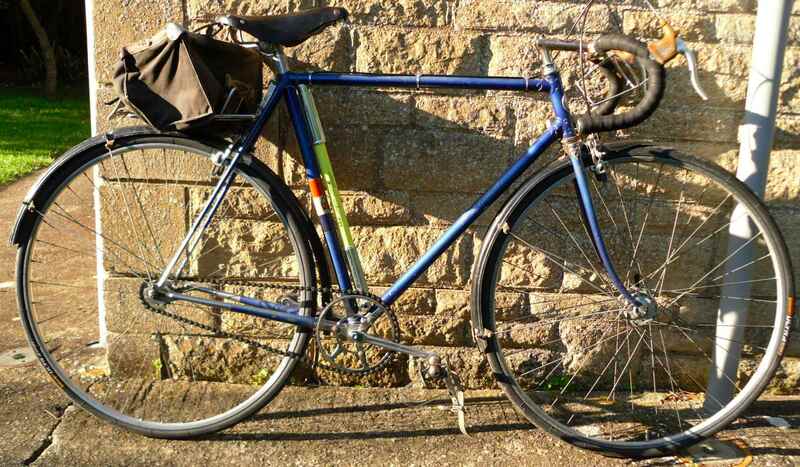 The three of us came mainly for the ride (and of course for the inevitable and unavoidable cyclejumble in which I found a bell for my latest acquisition, a ca. 1930 Miele, and a 1939 AW stamped “Patent applied for”). The pace was rather leisurely, 13 kph, and ADFC (German CTC / Wheelmen equivalent) helpers in there orange vests were everywhere and shepherded the roughly 100 riders safely. Another very good job. The accompanying Police were overanxious and overly strict, though, stopping us, dishing out admonitions, and making the 17 kilometers seem longer than they were. At 9.30 people were slowly assembling for the ride near one of the many exits of the museum, giving onlookers a chance to appreciate some very elaborately done costumes. 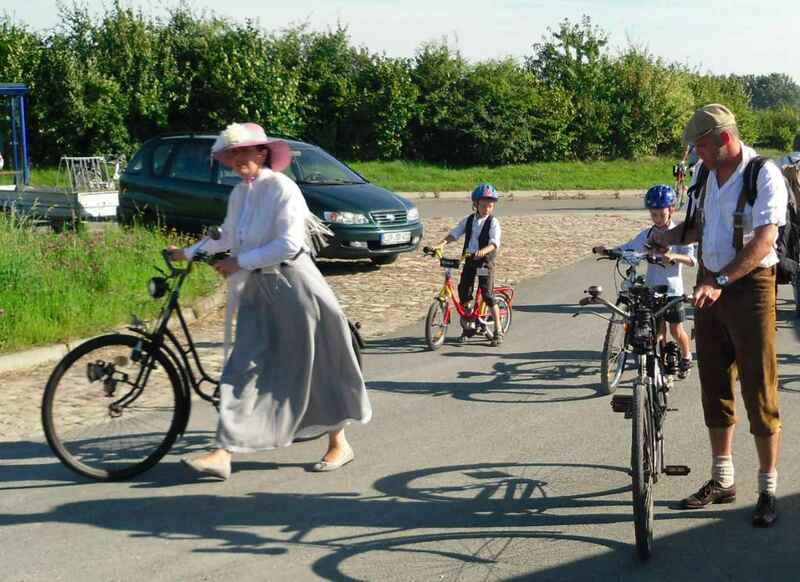 I personally think that those costumes distract from the bikes, but many people seem to enjoy historical crossdressing. The racer boys were getting envious glances from the bread and butter cycle riders, or so it seemed. Then we were off in the blistering heat. 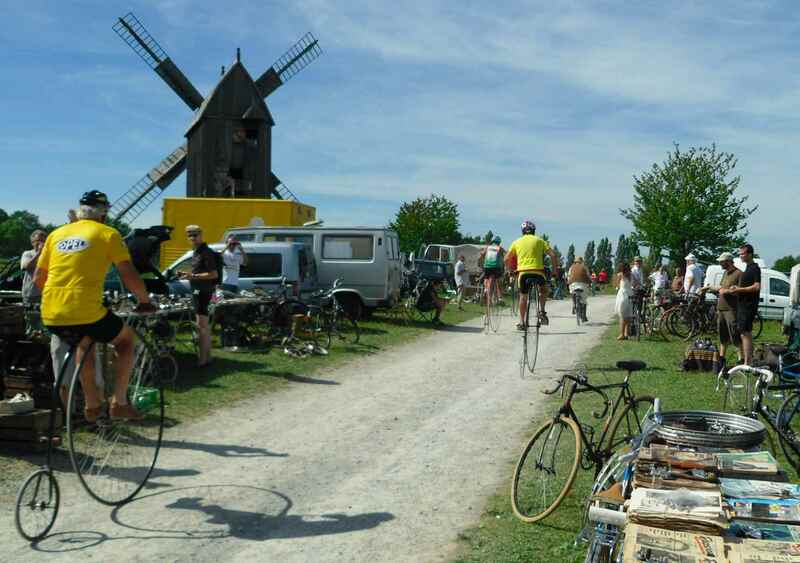 Here some of us are, cycling through one of the picturesque villages on the way. 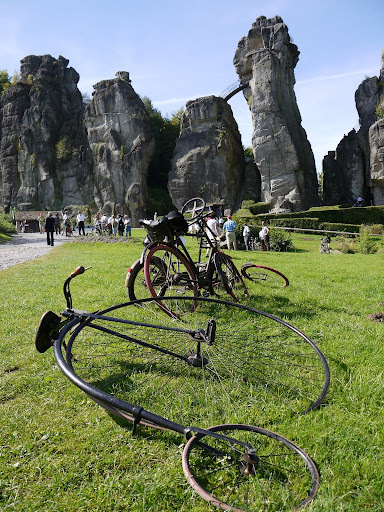 The highlight of the ride were Externsteine for which there is a Wikipedia article, also in English. We took a long rest there and were doled out some rather nice hot soup in a neighbouring restaurant. 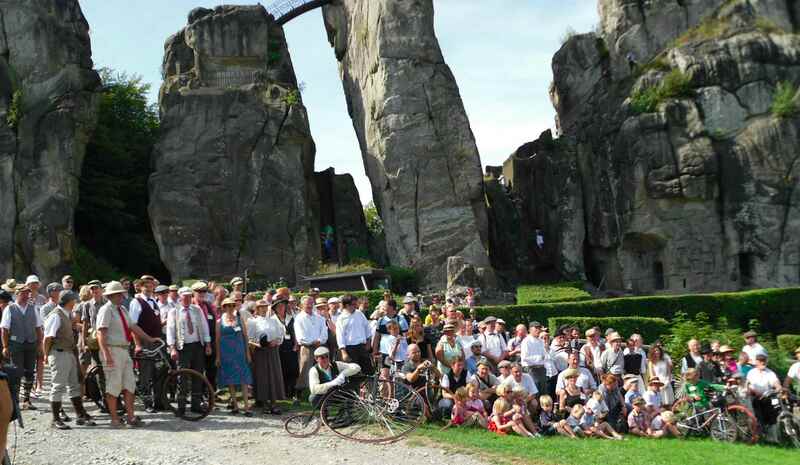 Here´s a group foto in front of Externsteine; my son took it while I was grinning away in the throng. Before that we had all dispersed into the shady wooded parts of the park. On the way back the Police found that we were a very undisciplined lot so they officially gave up chaperoning us. The groups they had required we form fell apart, so that a more familiar atmosphere of riding at a personal pace while talking to friends and a general enjoyment of the nice day prevailed. Here´s some of us on the last meters of the ride looking forward to a cool drink. 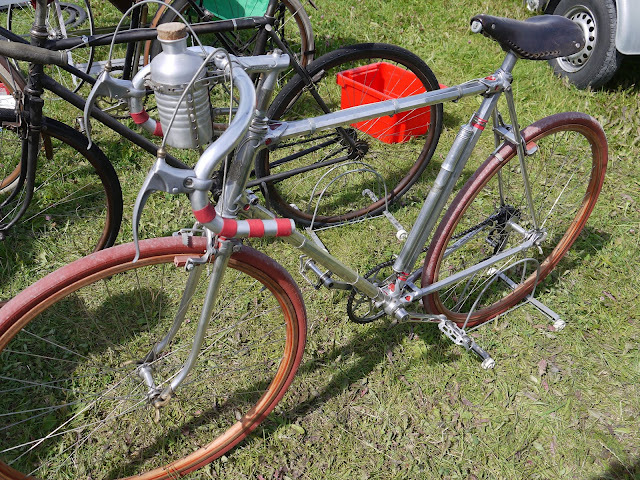 What´s needed of course are some pics of the nicer bikes we saw. 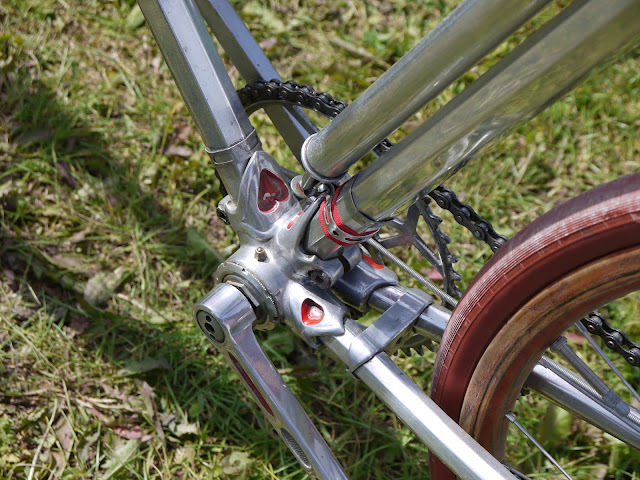 First there was a Caminargent; not exactly fitting into the blog´s “steel frame” category, but a nice bike nevertheless. 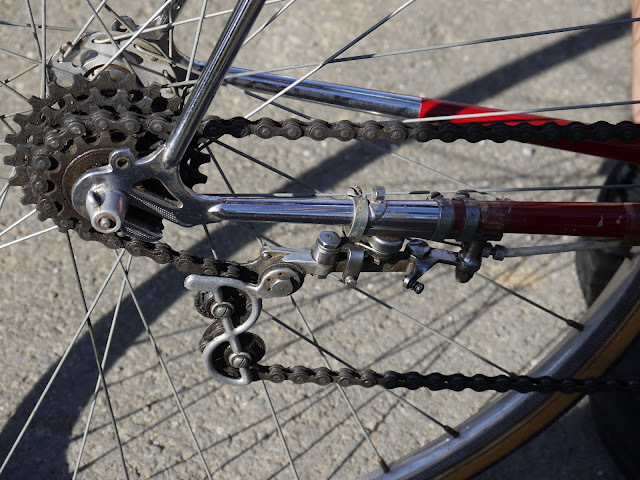 I also liked the Bauer featuring a full Altenburger groupset a lot. Next there was a beautiful black and red Jack Taylor with some very interesting and unusual touches. 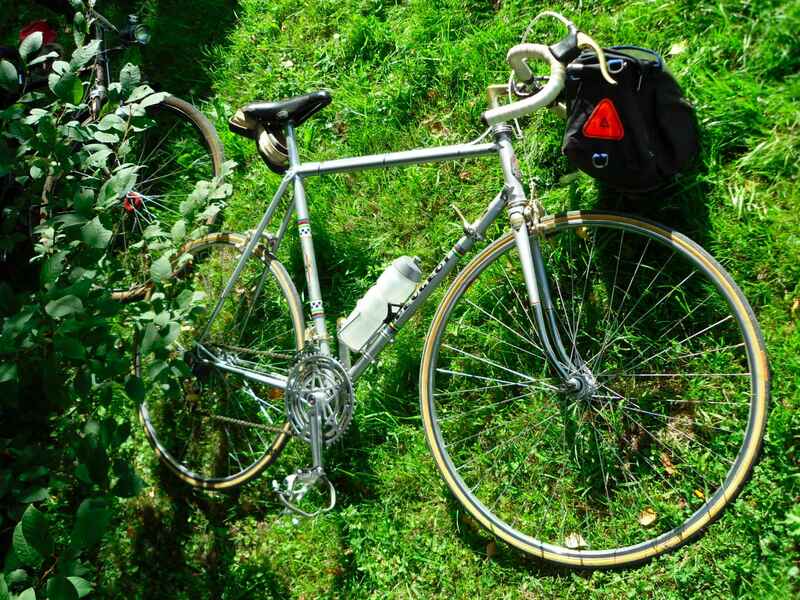 And of course Oscar´s own immaculate 1975 PY 10, seen here reposing in the grass after the strenuous 8 km to Externsteine. What would a meet be without the weird and wonderful? Take this sociable for instance. 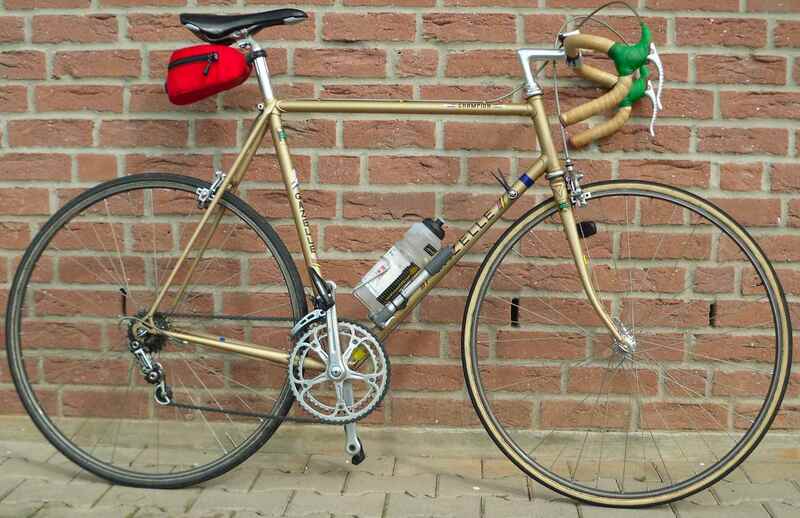 Also some really great and unusal bike were to be seen, unusal mainly because they usually are not to be found in Germany, like this Peugeot having come from Belgium. 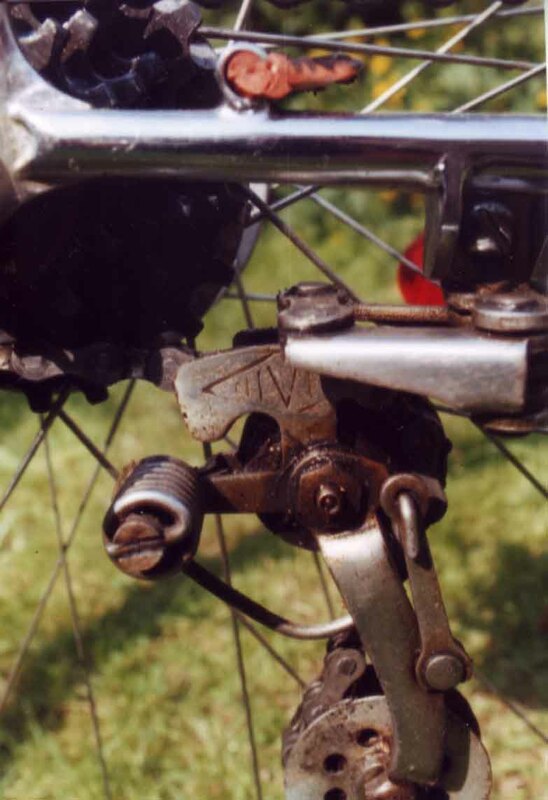 Of course there´s always the weird and not quite wonderful, too, like this Chater parts tandem someone thought might have been used for pacing during the early 1890s. 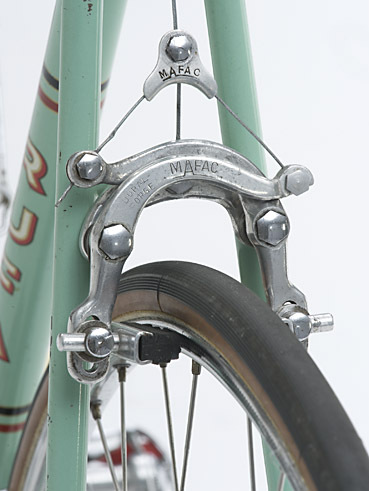 What sense does it make to use such a small main drive chainwheel for pacing, and of course the forks of the paced single seater bikes were reversed, used with small size wheels to increase closeness to the drafting bicycle/motorcycle, and the forks of the drafting tandems/multiseaters stayed what they were. 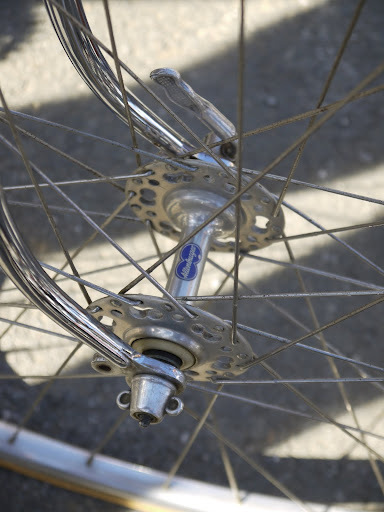 As to disc wheels – well. 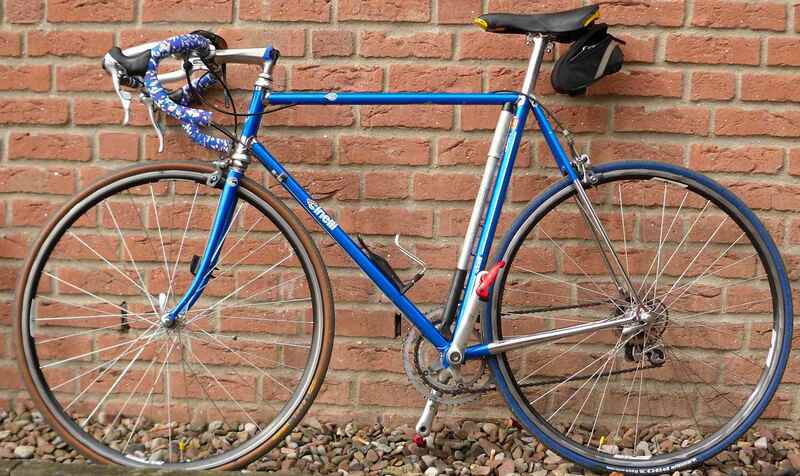 A chance to have a truly great quality tandem on the road missed for a cheap and ahistorical effect. I´d like to finish with a nice and typical scene, though. 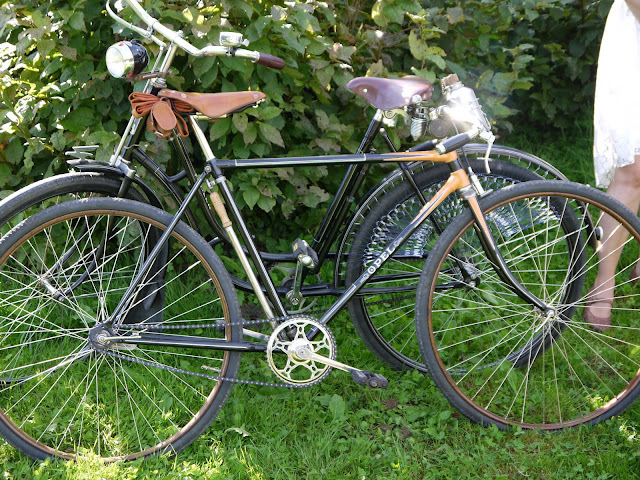 This pair of 1930s Opel bikes were lovingly restored to a quite high standard and ridden by a couple, both enjoying the old bicycle hobby. That´s what it is all about, isn´t it? 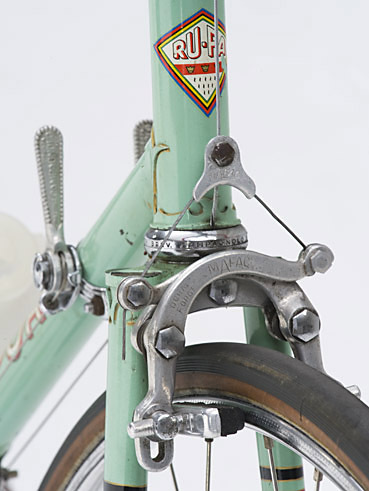 As an example of a German racing bike frame from the early sixties, this bike can´t be beat. 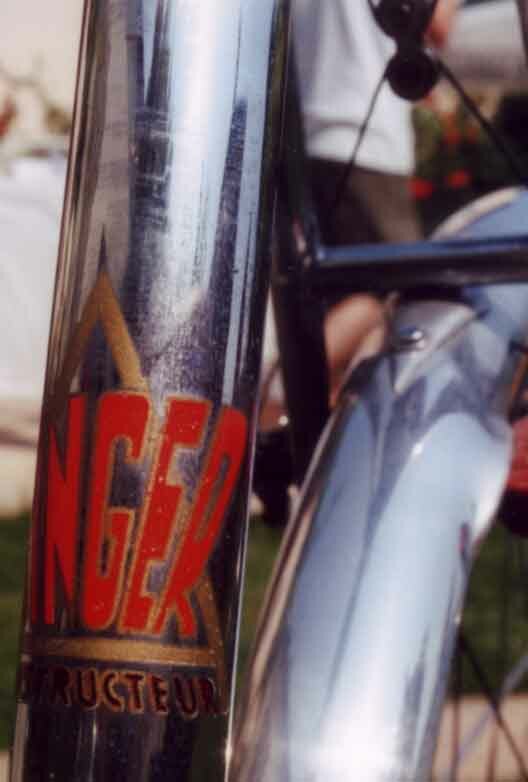 It was built by a small Cologne based builder who obviously knew his job, using Reynolds tubing and Nervex lugs. 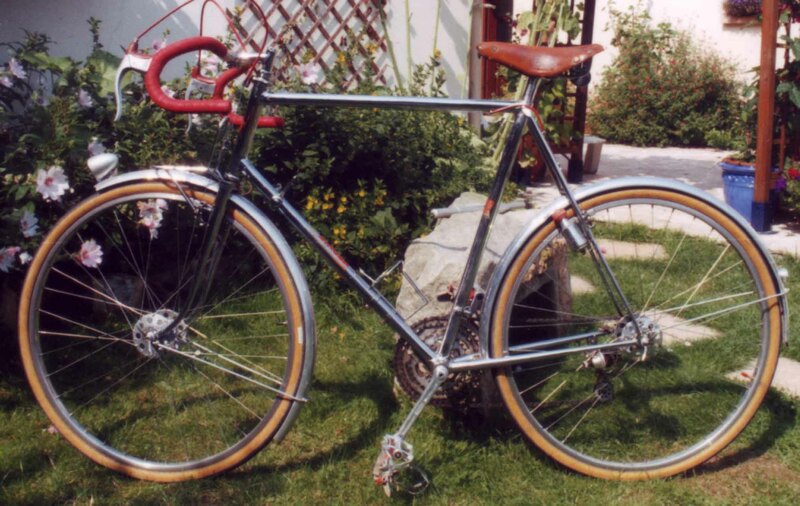 The great thing about the frame is that it is in original condition and as a bike it was built up by the current owner sparing no expense. 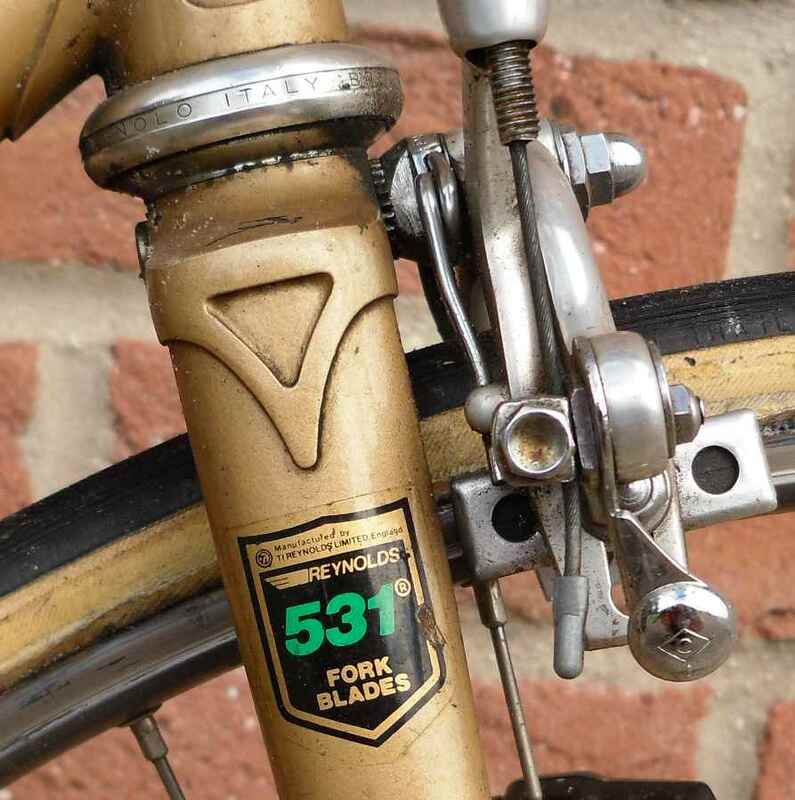 The frame size of 58 cm c/t means that it was first built for someone rather tall for his day. Of course time and use have left their traces, but all in all it´s rather presentable still. 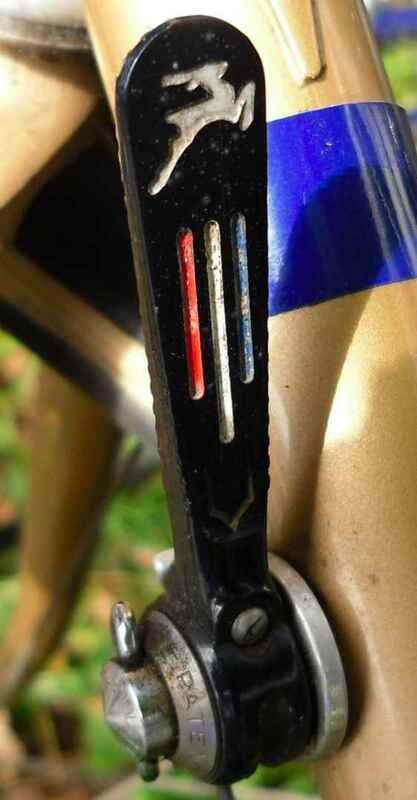 Also the component combo is choice; one might say pro quality. 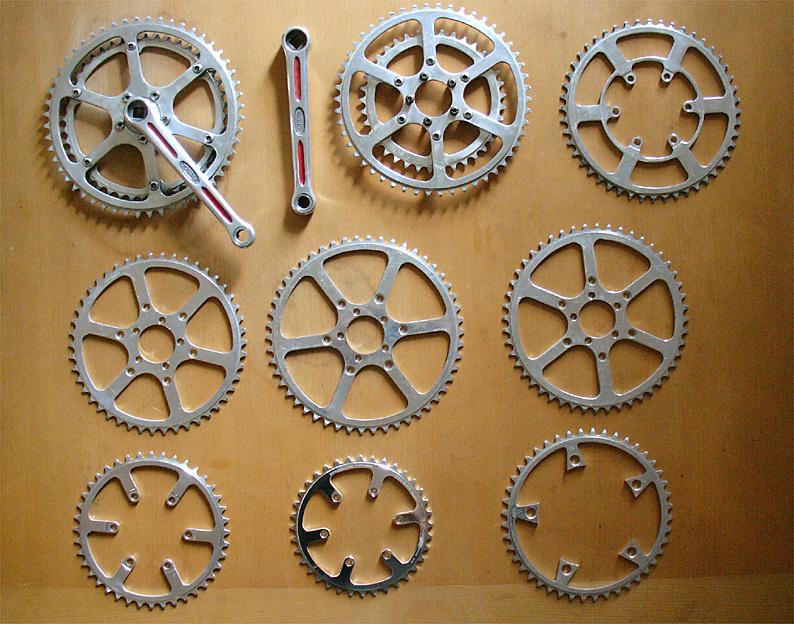 Some of the spare parts that come with the bike. 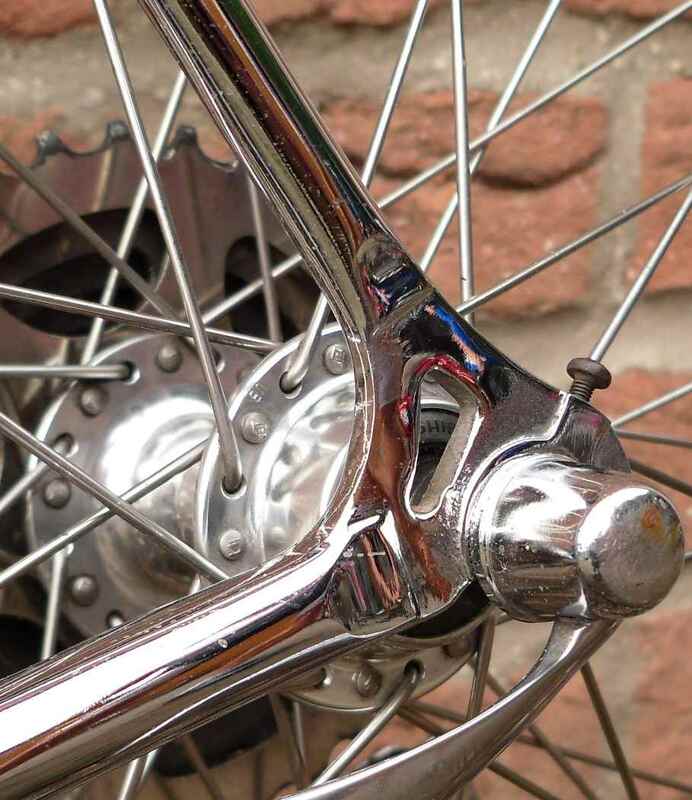 -diverse parts like headbearing, shift levers, etc. Before you think that my photography skills have improved by leaps and bounds let me tell you that the Rufa owner is a professional photographer. Rest assured that the following posts will return to the snap quality you´re used to. 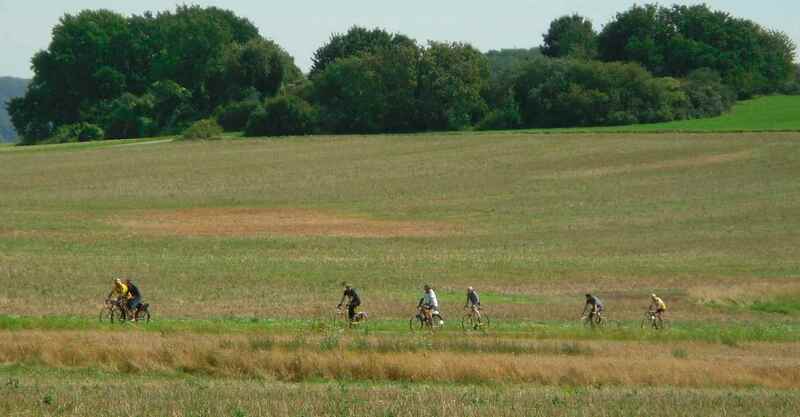 On our visit to Oxfordshire recently I liked many things, of course, but one issue which I found extremely helpful when out and about on the bike was the near-complete absence of cyclepaths. This may at a first glance look strange, but if you are an ambitious cyclist, trying to get anywhere, maybe at a good speed too, cyclepaths are a dangerous nuisance, full stop. 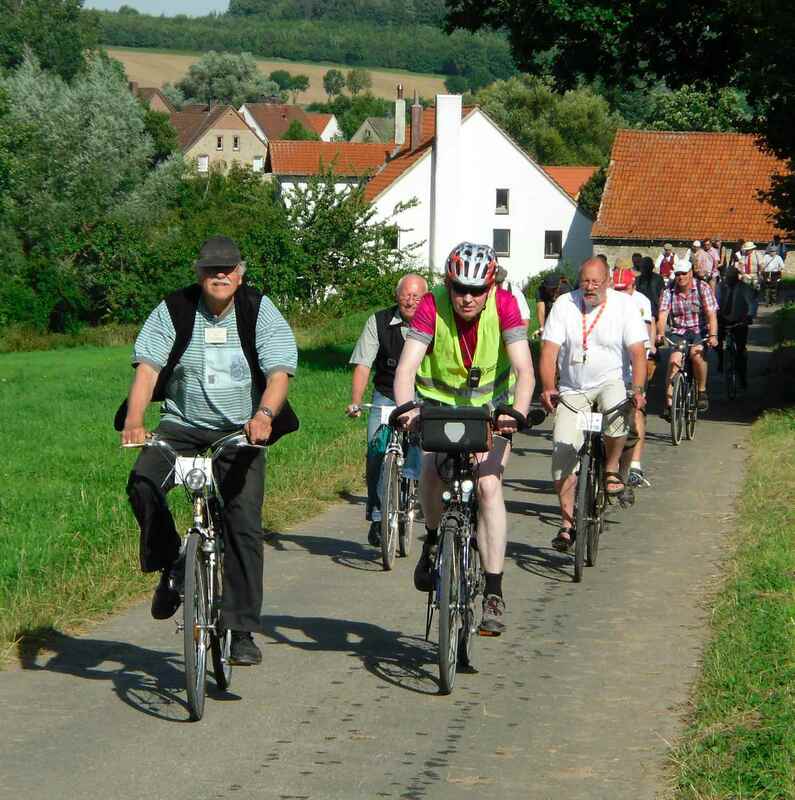 The friends we visited said that they didn´t like cycling in Germany now because there were that many cyclepaths. Right they are. 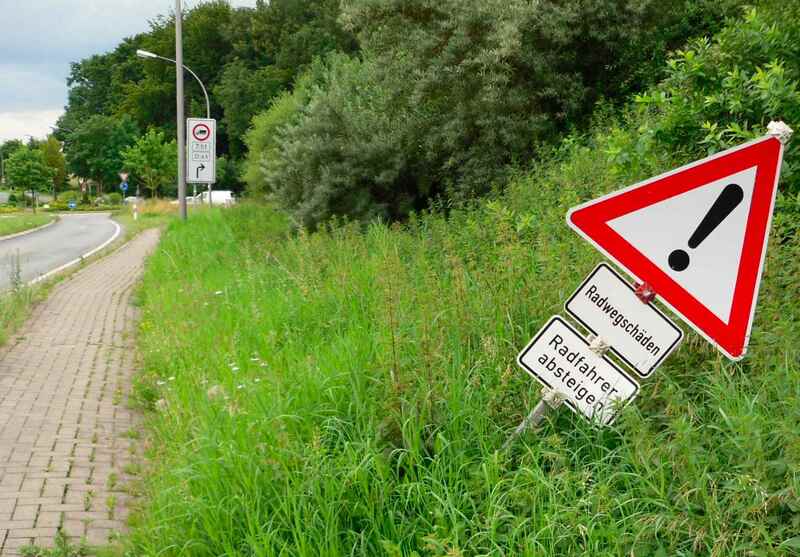 In Germany, whenever there is a blue, round roadsign with a cycle on it, cyclists are compelled by law to use the cyclepath, never mind its condition. Potholes, debris – no matter. The only exeption is when the path is physically blocked, i.e. by snow or fallen trees. 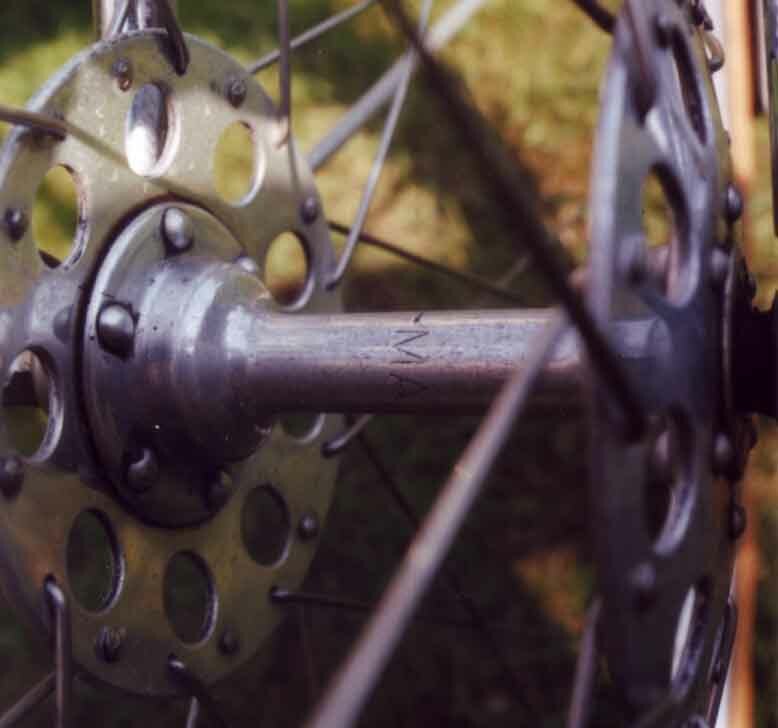 A recent court decision states that cyclists must use cyclepaths in all other cases, they must go slower, even dismount, when the condition of the cyclepaths demands it, but they must not use the road. Town councils are not required to repair cyclepaths; the only requirement is that they put up more roadsigns to tell cyclists that the cyclepath is dangerous to avoid any liability. This does not acquit cyclists from the requirement to use those paths. The photo below was taken in Melle. For the uninformed it is probably even hard to see what the cyclepath actually is. The additonal signs say “Damaged Cyclepath” and “Cyclists Dismount”. 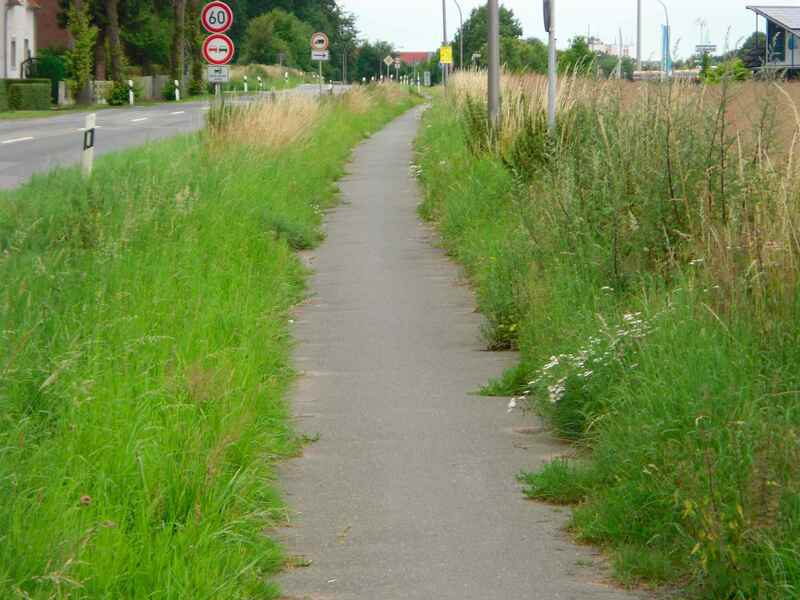 Great cyclepath where you have to push your bike. This proves an idea I have had a long time ago: Cyclepaths are not there to facilitate cycling, but motoring. 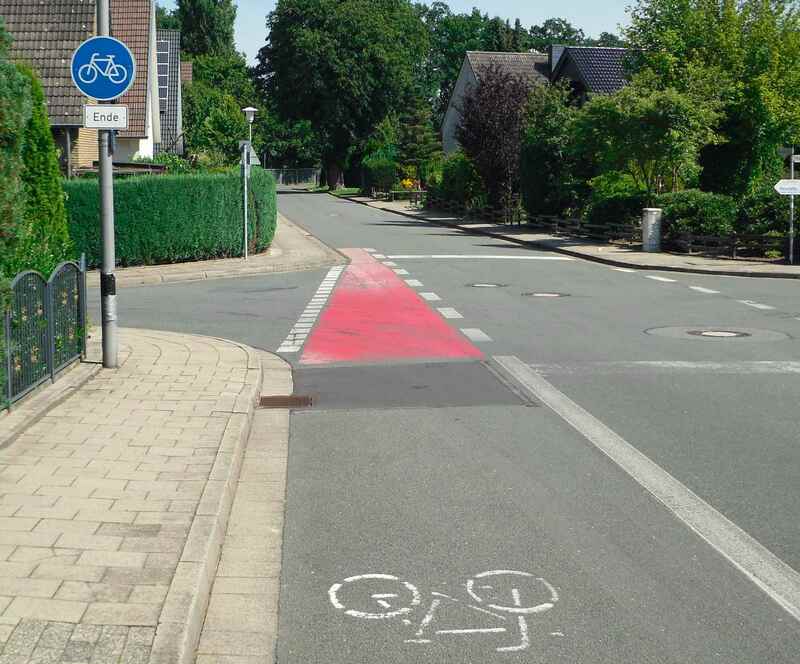 Get the cyclists out of the drivers´ way by constructing a cheap cyclepath, put up the right roadsigns, and forget about the cyclists and the cyclepath. 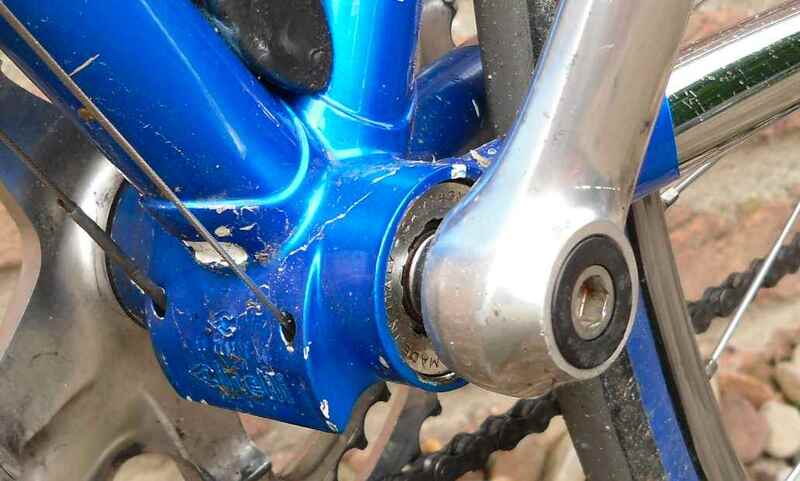 No need to look after cyclists´ infrastructure, if you may call it that, there´s the blue roadsign. That´s what it is like. Proof? 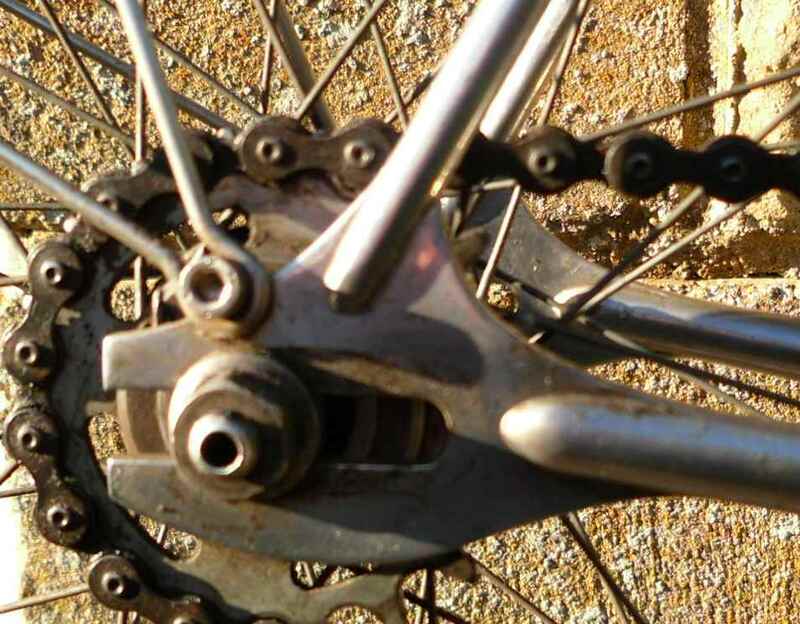 Here´s some snaps I took on my rides, all within an easy cycling radius of, say, 50 km around where I live. 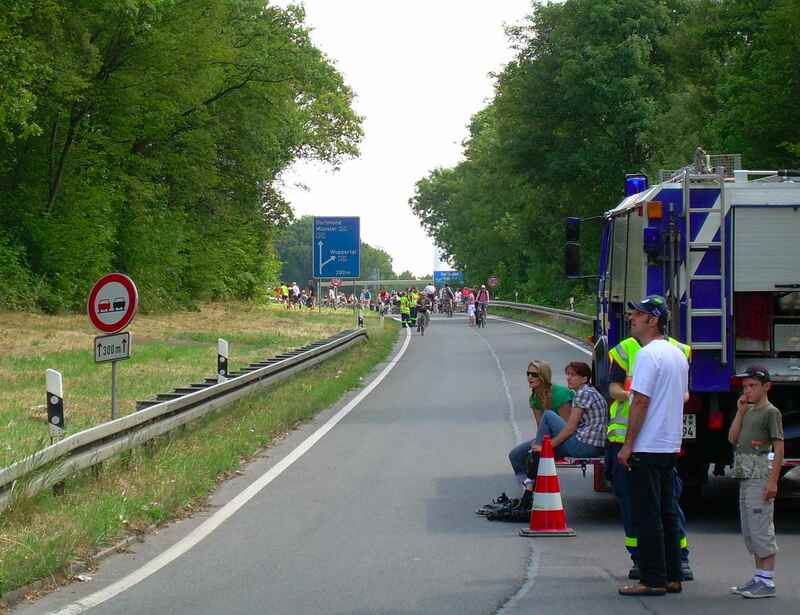 A small aside: Of course many policemen are cyclists themselves, and numerous are the instances when a patrol car overtook me when I was cycling in the road next to a cyclepath, and the officers didn´t do anything. However, some did do something, and if an accident should happen, no insurance will pay anything if you´re not where the powers that be say you belong. That´s the real problem. 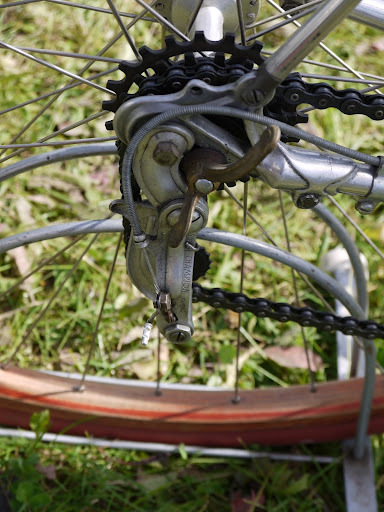 There are numerous examples of completely neglected cyclepaths in the area. The problem of course is that paths are made very cheaply. Any mole with a mediocre work ethos will destroy a path in a matter of weeks. Building one path for both directions is something seen very often. Here it is the case, too. So you cycle along the path, having probably stopped for the motorist emerging from the road to the left because you were overlooked, and then you proceed straight into oncoming traffic when the path ends. This is in a town called Lotte. 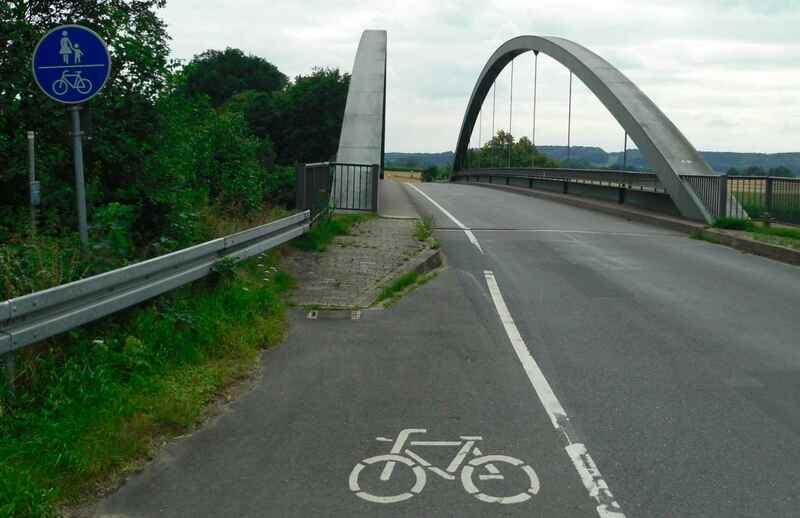 Same problem on this canal bridge, near Hunteburg, only that the bridge does´t allow you to escape anywhere. Imagine sticking to the cyclepath on the wrong side of the road with a lorry coming towards you. Here you also have to negotiate pedestrians who are in the same lane as you. Basically it is a good thing that German authorities are coming to their senses now, building more roundabouts instead of traffic lights. 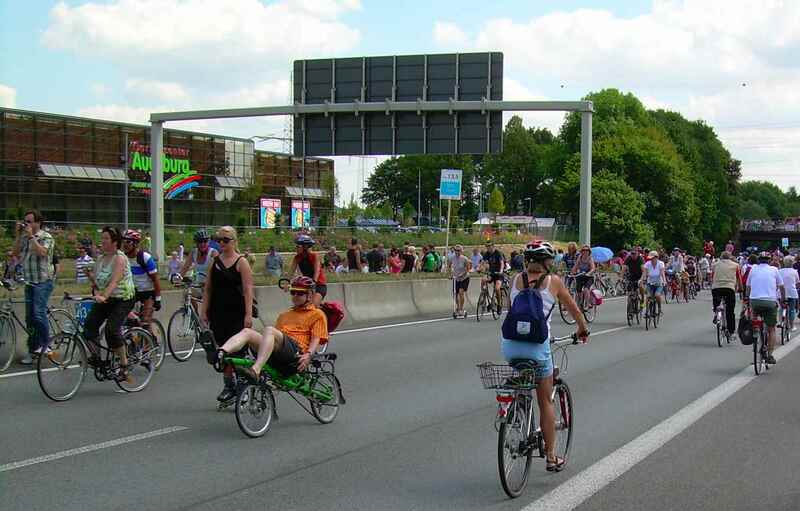 However, there´s a nasty surprise in it for cyclists: Once in the roundabout, cars of course have right of way. Cyclists are redirected to a small cyclepath, and they have to give way at each intersection with traffic going into or emerging from the roundabout. This will considerably slow their progress and it is dangerous, too, because this rule is so daft that many motorists will wait for you – until they see that they unexpectedly have right of way and accelerate again. This example is near Icker. 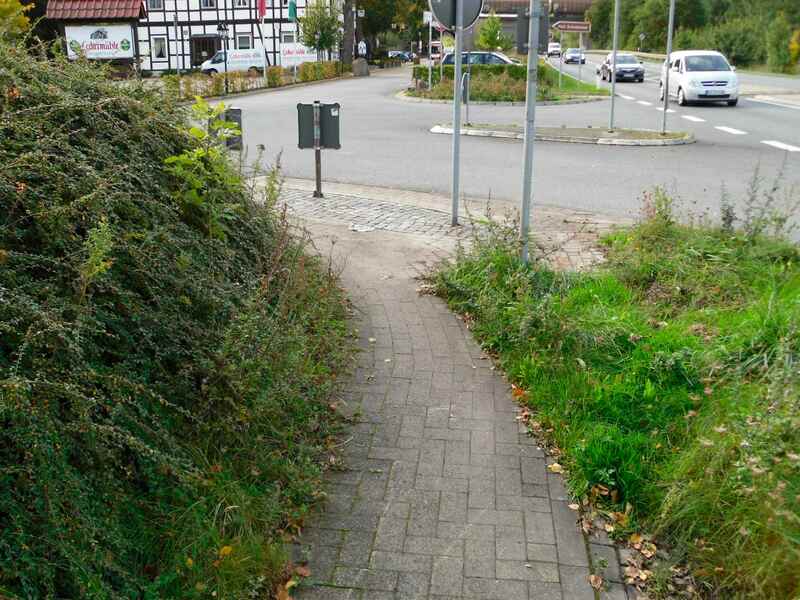 Another example of a really dangerous path is this, on the so-called Leckermühle roundabout. This really is a cyclepath for both directions of traffic. The road in the top right hand corner is a dual carriageway and forbidden for cyclists. The one leading to the half timbered house is the one cyclists will have to use once they have made it safely off the cyclepath. Right, and what about the competition? What´s the giveaway? 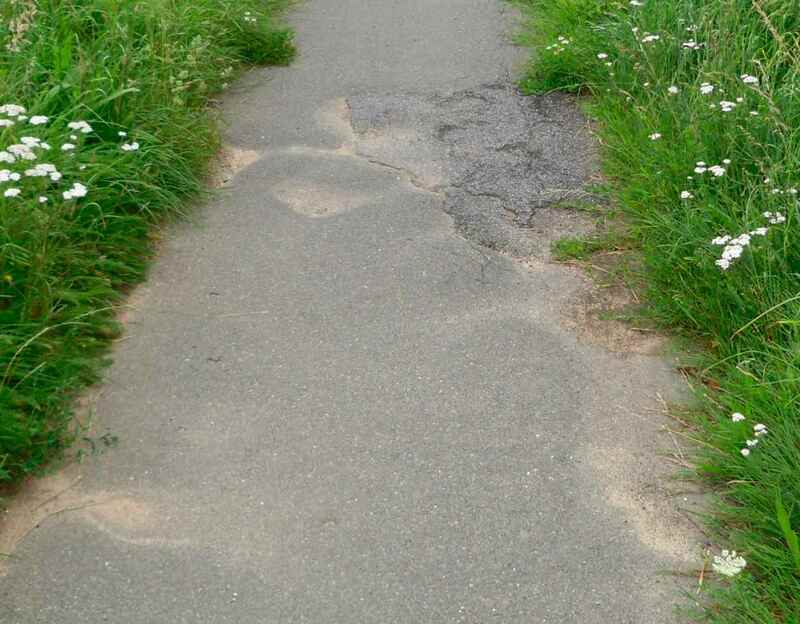 It´s a pothole from any of the numerous infamous Melle cyclepaths. Maybe this way we´re going to get rid of them. To get a pothole you have to send in snaps of other dangerous paths, from any country, and I will publish them here. Write a comment, and I´ll give you an e-mail address to send the pics to. The worst path will receive the prize. 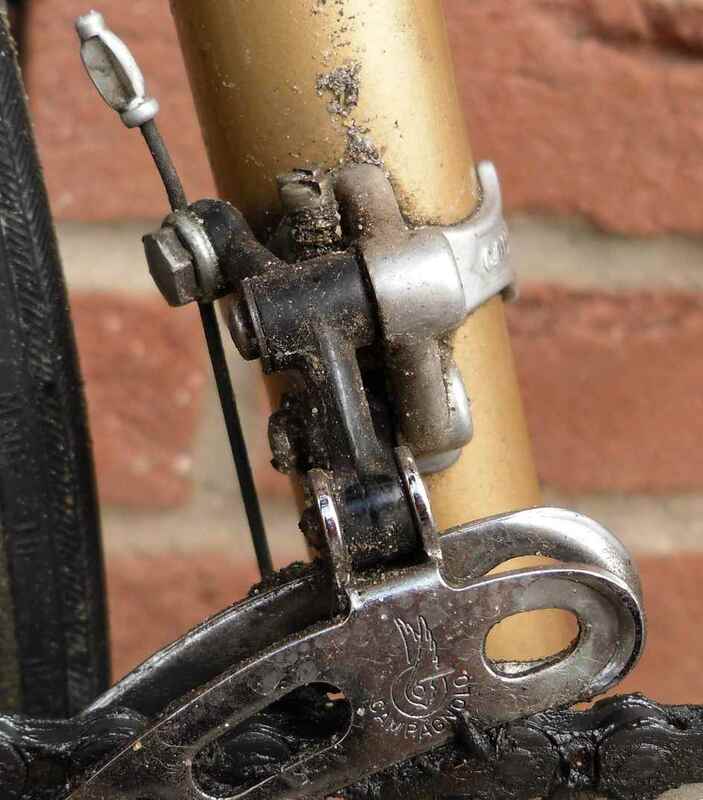 When taking the yellow Lüders to bits recently I found a pair of most unusual (to me) brake levers.I have since asked several people who are rather experienced with older bike parts, they had never seen any like them, either. Yes, this is really in there. 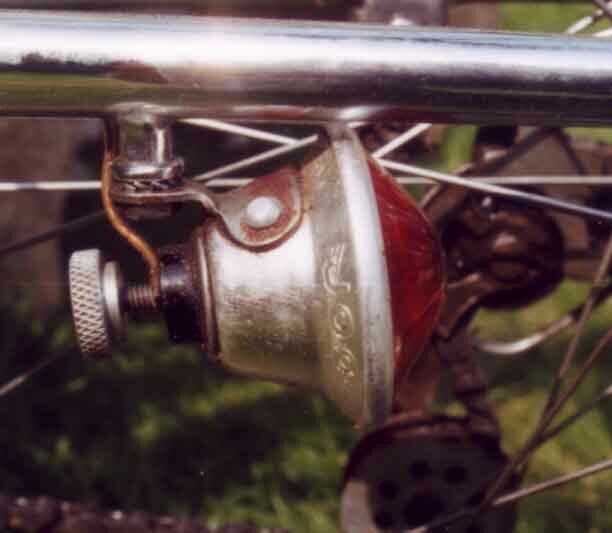 It´s a pulley held by two bolts rather resembling chainwheel bolts. 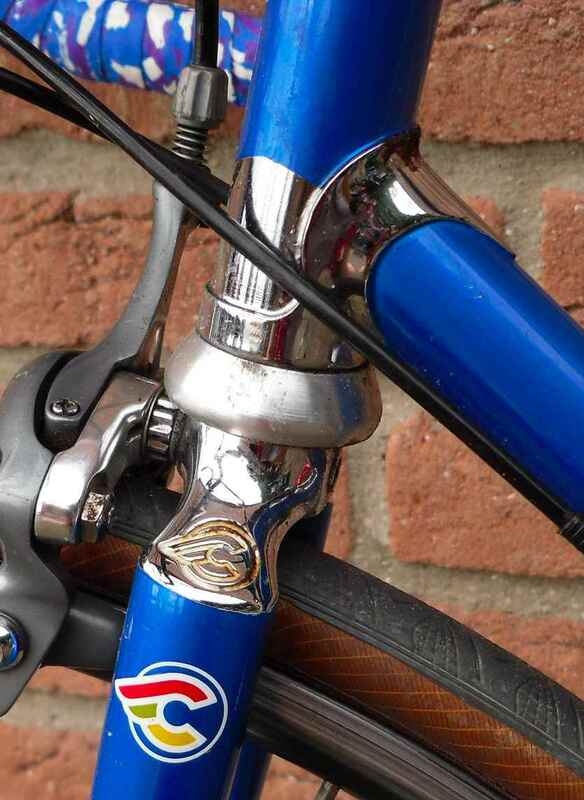 They look professionally made, quite worthy of Campag originals, and also the hole in the brake lever is well executed. Definitively no aftermarket conversion, to my mind. 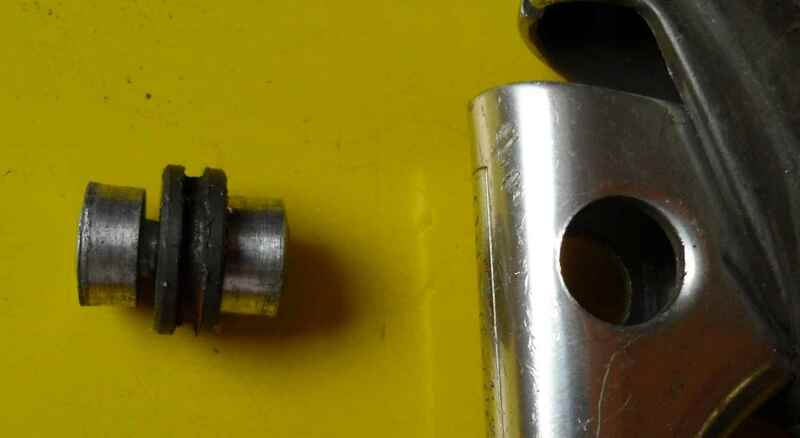 Here´s what the bolts and pulley look in- and outside the lever. 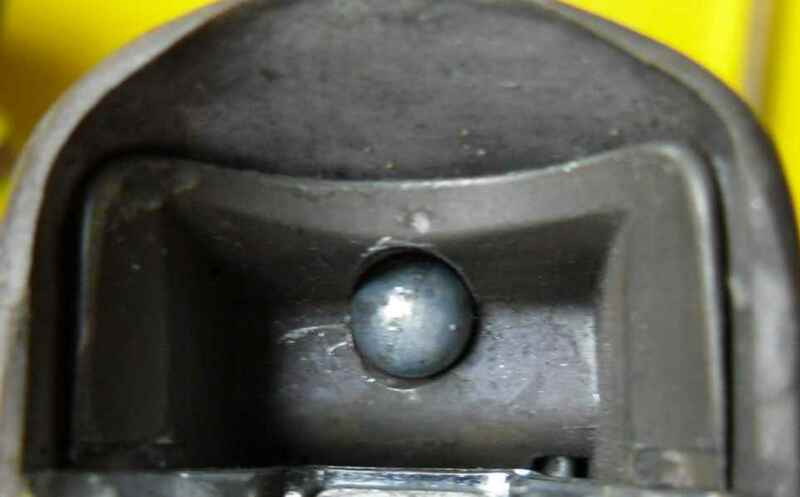 Again, the execution looks professional, there is obviously original gray paint in the hole you have to thread the inner cable though. 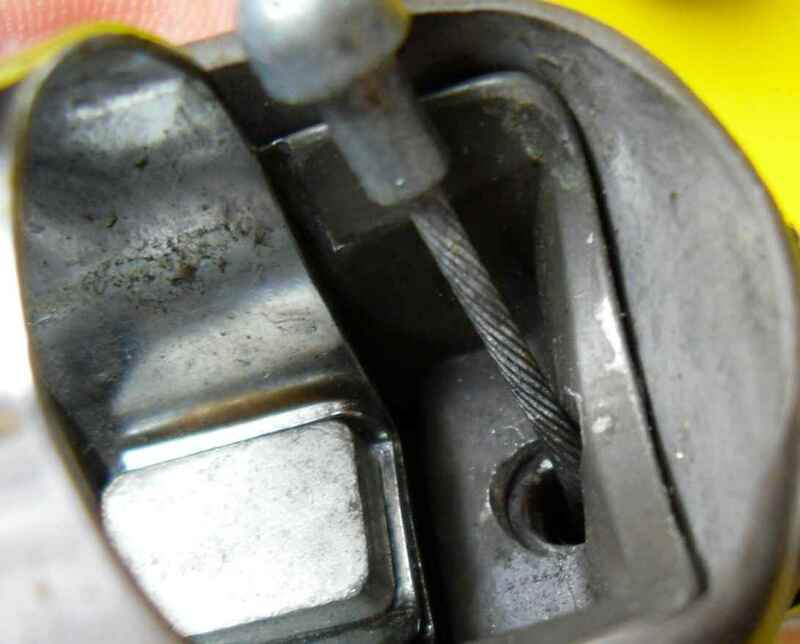 It then is somehow fiddled round the pulley, which of course will move forward when the lever is pulled, thereby pulling on the inner cable and actuating the brake calipers. 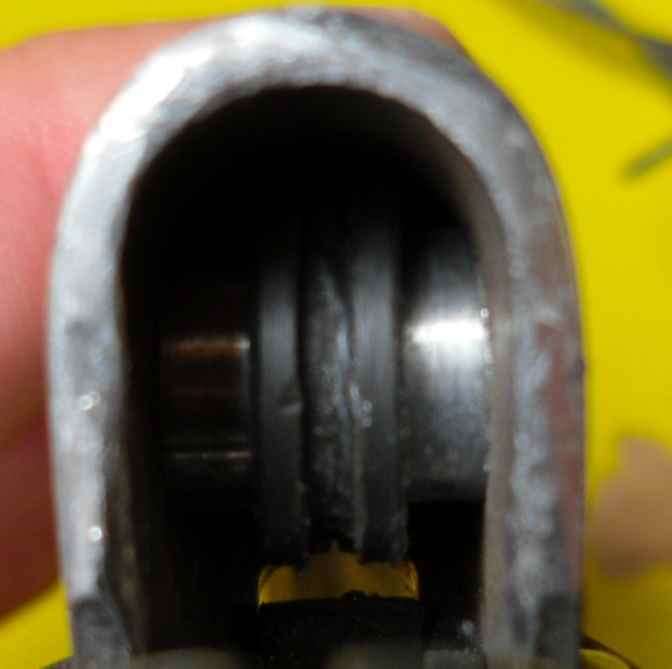 The bad thing is that the inner goes round the pulley at a relatively sharp angle; it won´t last long. And also this is where it gets complicated. 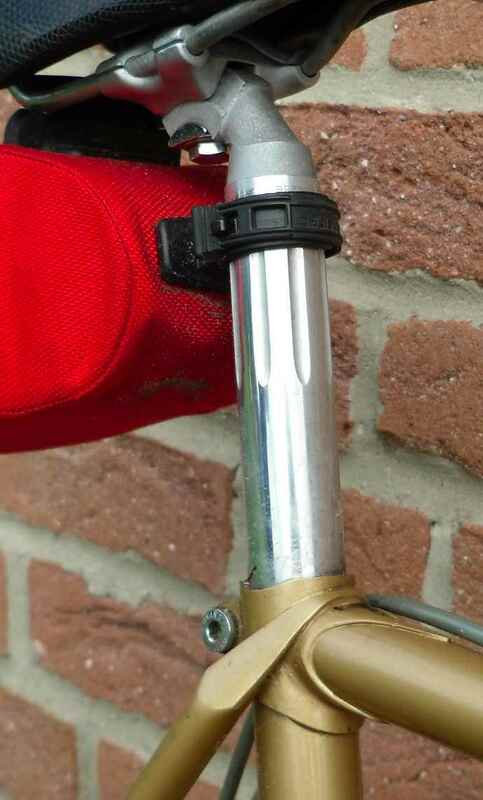 Fitting an inner cable is impossible without taking the bolts and pulleys out, and of course the complete lever off the handlebars. Dangerous and completely misconceived, I´d say. 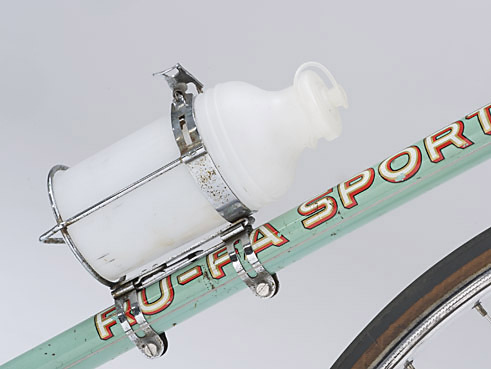 Nevertheless the whole arrangement is Campag, no doubt about that. 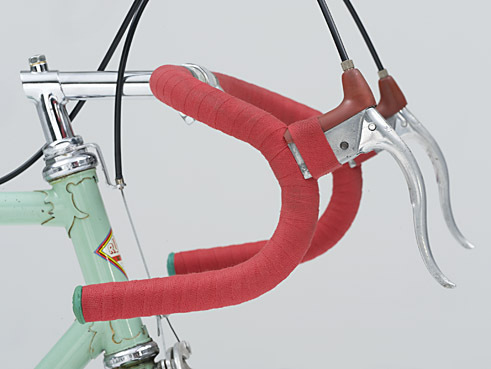 Any help putting a year to these levers, or explaining the reasons behind the daft construction, anyone? There´s three blogs/websites I have discovered recently, all of them after being told of their existence by their owners, as my internet abilities still remain rather rudimentary. 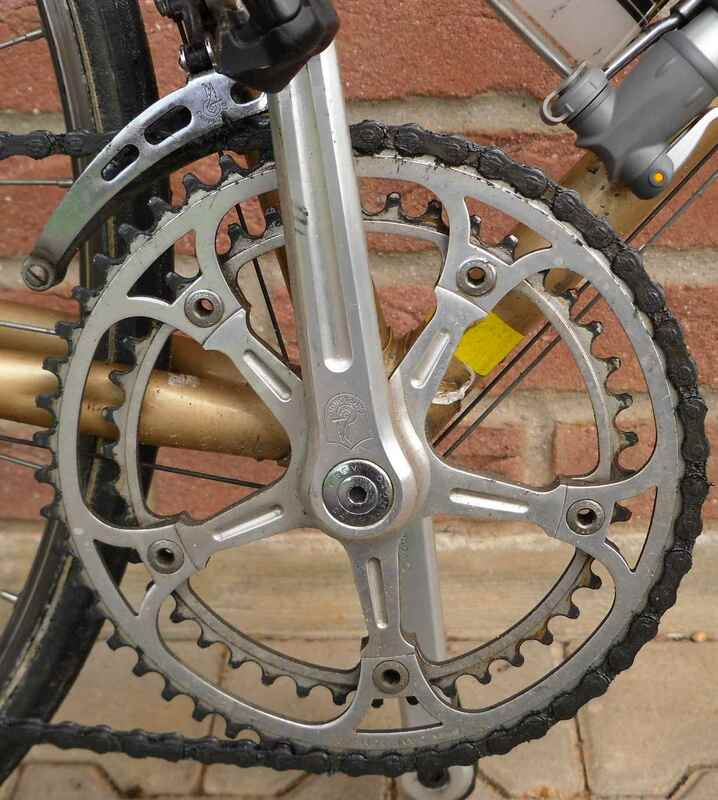 One of them is brand spanking new, and certainly will become an interesting source of specialized info, given the enthusiasm displayed by its owner: It´s on bikes built in the Ruhr area of Germany. Of course as soon as one hears this, names like Rickert, Schuhmacher, KRABO and others come to mind. 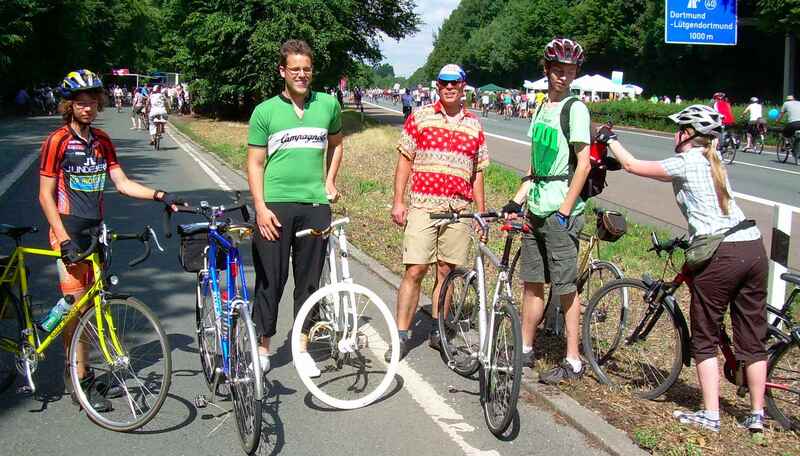 The Ruhr, and especially Dortmund, used to be and still is a hotspot of cycling activity. There is a great photo gallery already, so I can just say: Go ahead and pay Björn a visit. 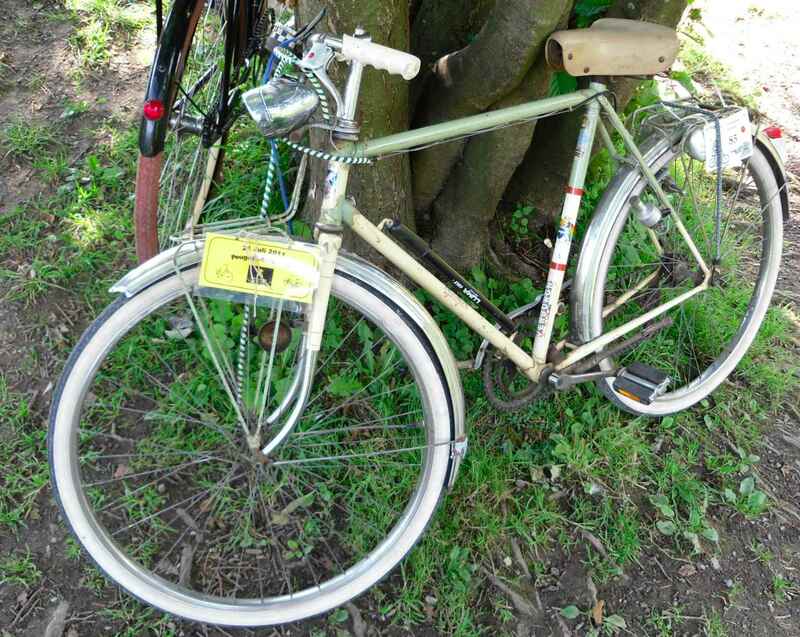 NRW-Klassiker BTW means that the site is about classic bicycles from Northrhine-Westphalia, a state/county in the North West of Germany, the heart of which is the Ruhr. 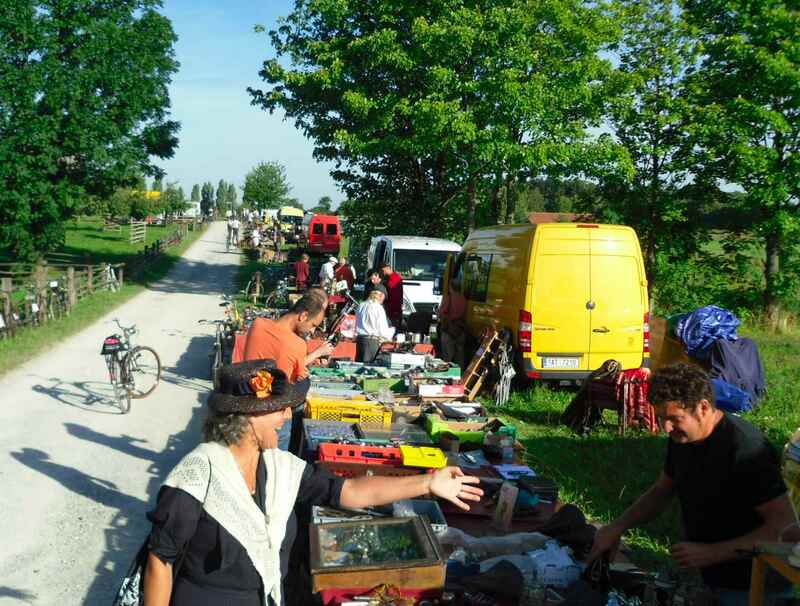 Well, I guess inhabitants of the Cologne area would object, especially as that city also is a major centre of cycling, but let´s not haggle. 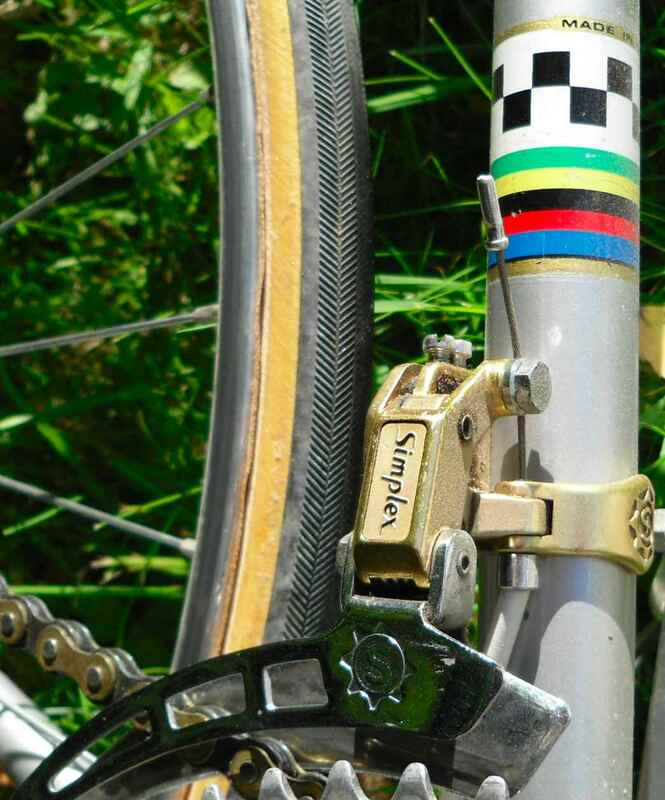 One more blog on bikes is Jan Heine´s web equivalent to Bicycle Quarterly. Published about as far away from Dortmund as is possible, in Seattle/WA, I personally think BQ is the best cycling mag anywhere at the moment, Jan´s cycling blog nearly equals this on the net. 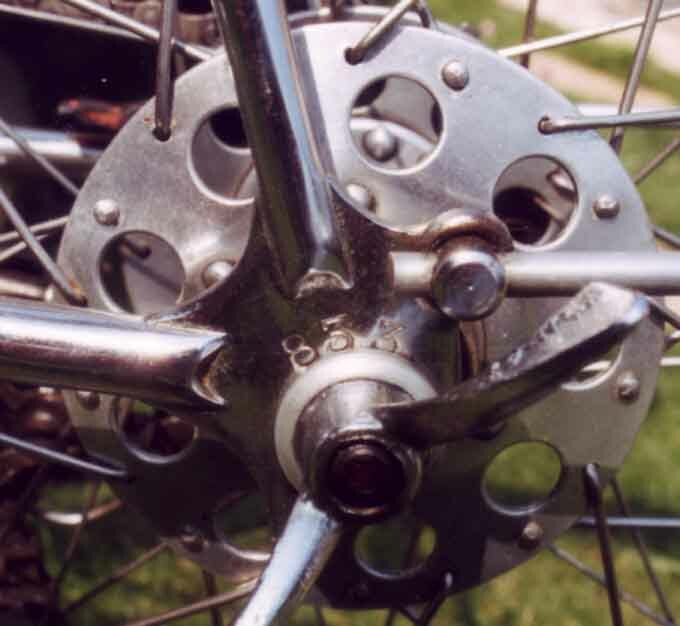 It offers info on the issues I need most; steel frame building, or mostly steel, randonneuring, French cycling history, info on Jan´s cycle parts mail order firm Compass Cycles, and some of the inner workings of BQ. All of it is written in Jan´s usual precise style and underpinned by sound quotations or scientific results from the BQ research team. 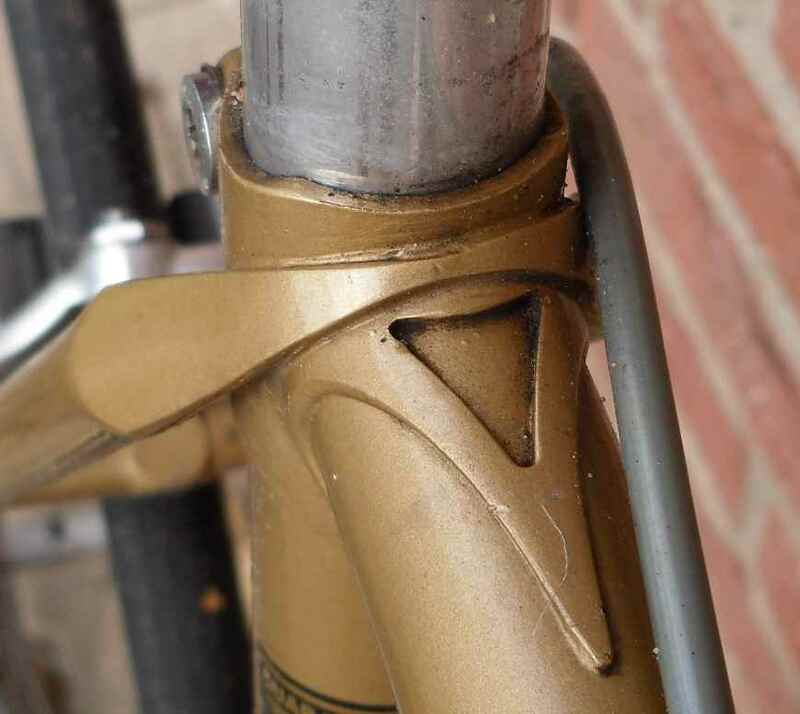 Lastly there is another blog which like Jan´s has been going for years, and which approaches cycling in a more artistic way. Mark Anderson is a photography teacher from Kansas, and so it´s small wonder that his pictures are just that. While mine are snaps, Mark´s are pics. The Early Morning Cyclist finds peace and quiet to utter original thought on cycling and photography, and Mark´s ideas about cycling couldn´t match mine better. 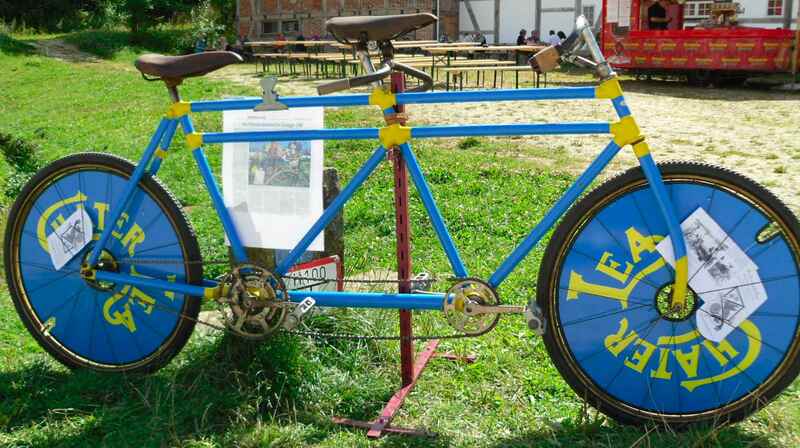 He also introduces the bikes in his stable, which are very nice indeed. Both Jan and Mark have posts on Grant Petersen´s latest book, Just Ride, which are interesting to read and which praise the book. I guess I must get it and write something on it, too. All three websites/blogs are places in the web I for one will be visiting frequently in the future. 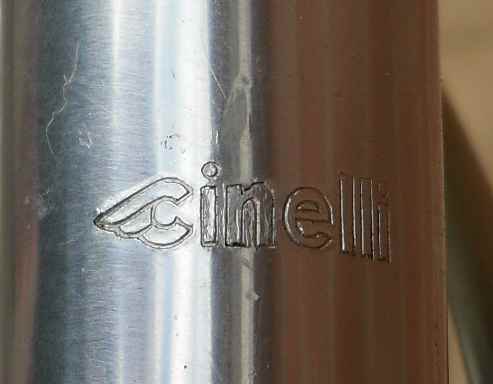 There´s not much to a Cinelli SC, outwardly. Plain, straightforward purebred looks. So not many snaps, either. 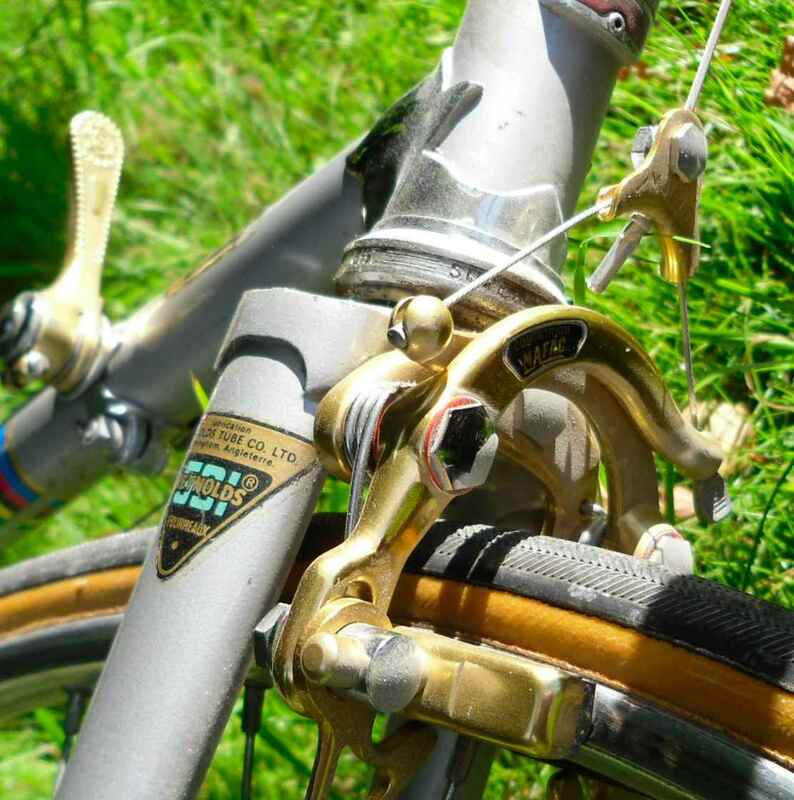 What I find out of keeping here is the Stronglight headset, but I guess it´s better than the original Campag one in any case. My, how I wish for a decent summer, for a change. Imagine that: Someone finds a 1983 Porsche in a barn, nice car, well kept, no major work necessary to put it back on the road. He decides to use it as long as it falls to pieces, because it´s just an old car. Who wants a 30 year old car, anyway. Or an old motorbike, say a 750 BMW from the seventies. Just an old motorbike. Ride it into the ground, get out what miles it has left in it, nobody cares. 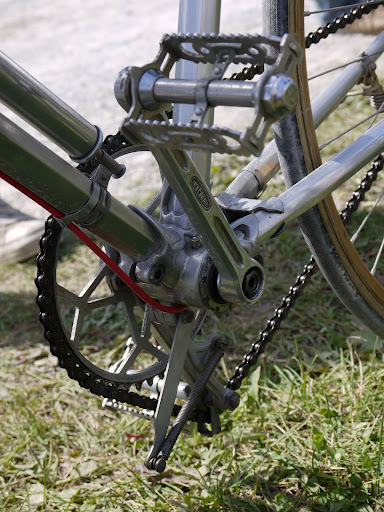 Or an old Gazelle racing bike, strange parts hanging on the frame, black Campagnolo stuff with just 12 speeds, ride it until it won´t work any longer and then scrap it. Which is the more likely to happen? Quite clear. I think this is a good example of lacking bike awareness. 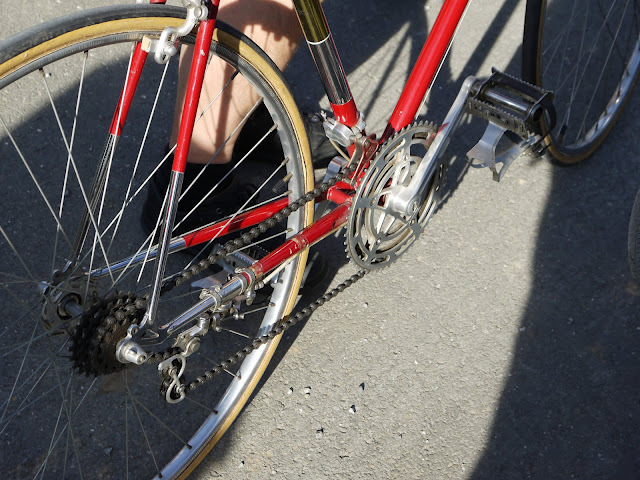 It´s just a bike, after all. 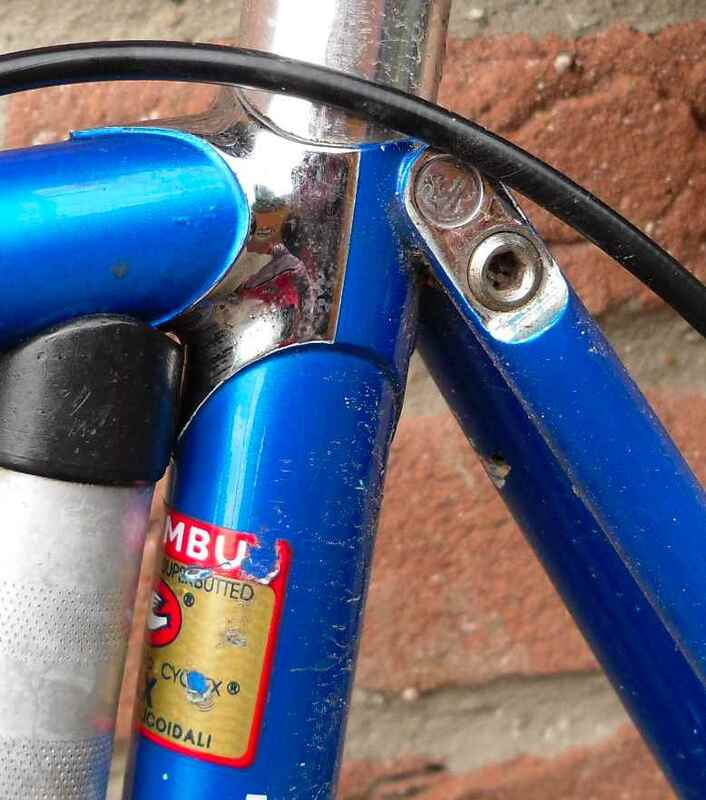 Also people often can´t imagine that there is a group of riders/collectors who have an eye for detail and who would like to ride a well kept 1983 Gazelle with an unmolested SR groupset just as much as others would like a 750 BMW or a sports car. 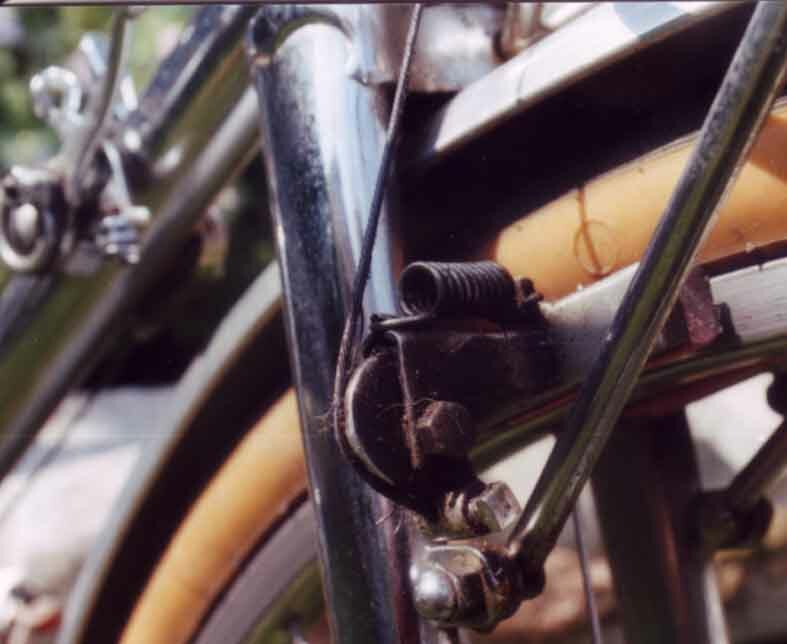 It´s just an old bike, after all. 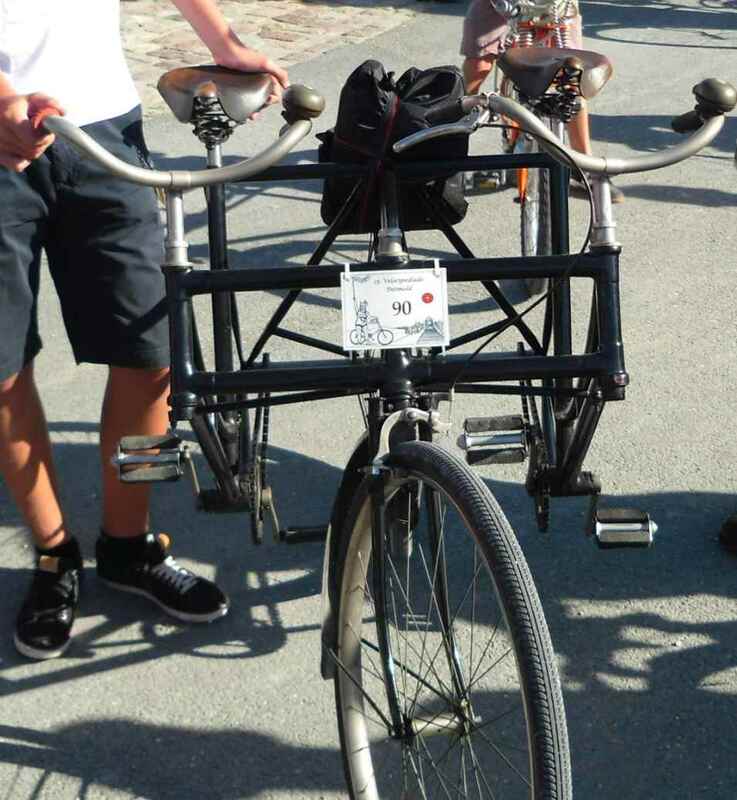 This is the bike I´m speaking about. Luckily the owner saw my point. 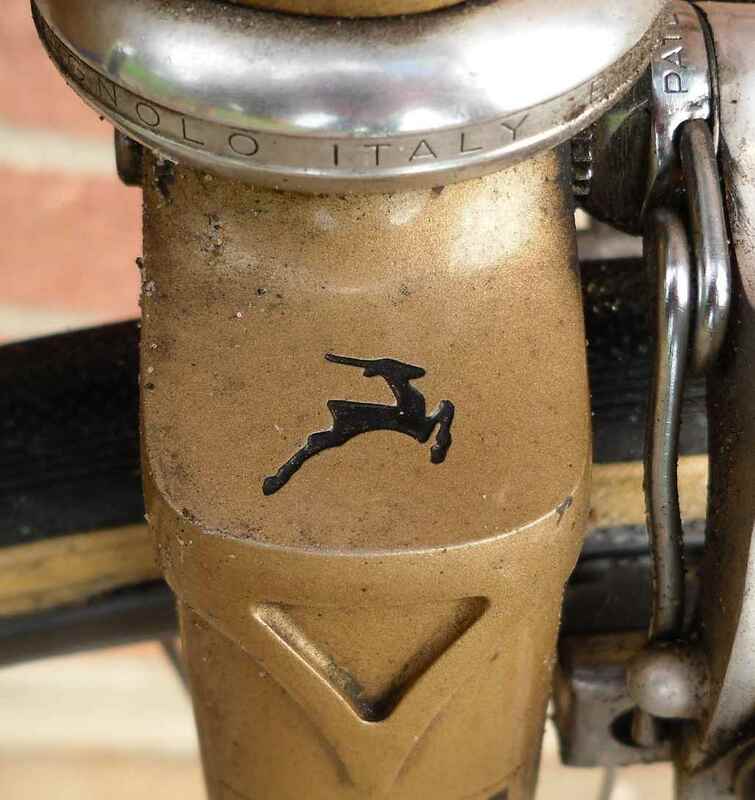 I think it helped when I told him that there was a value to the Gazelle. 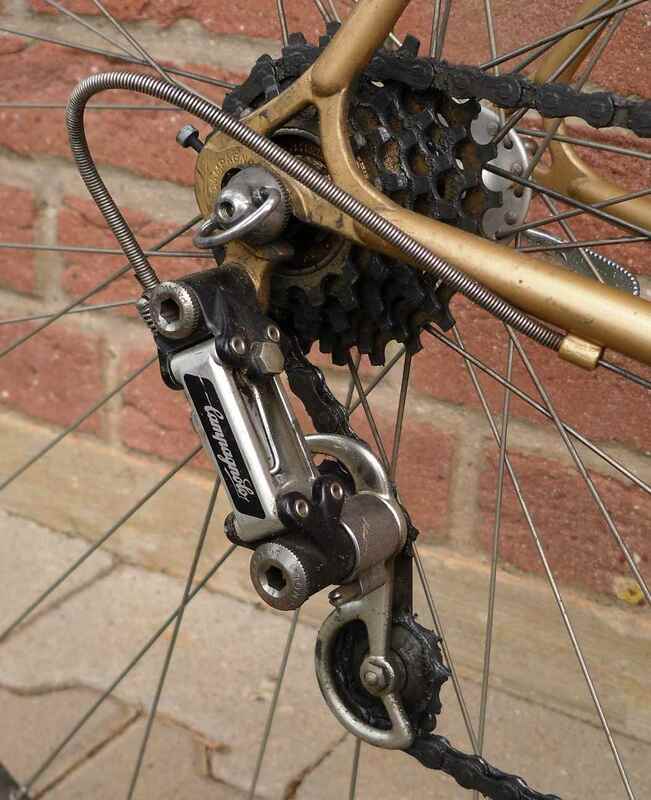 And some snaps of the SR groupset. Well over the limit, it seems to me. 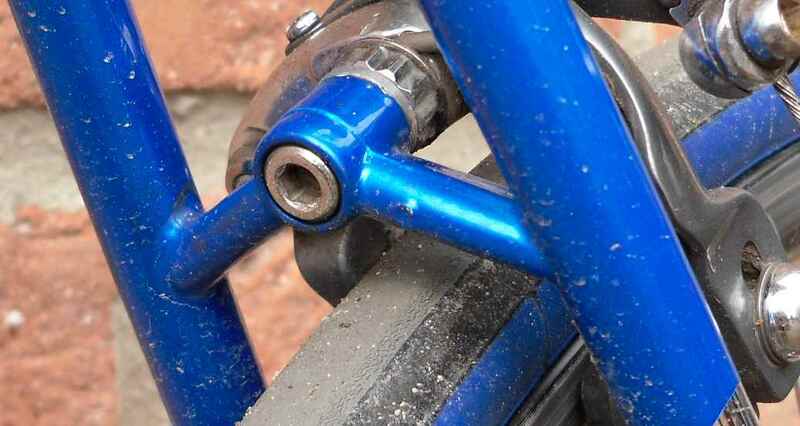 But then the owner wasn´t too sure how old the tubular cement on the rims was, either. 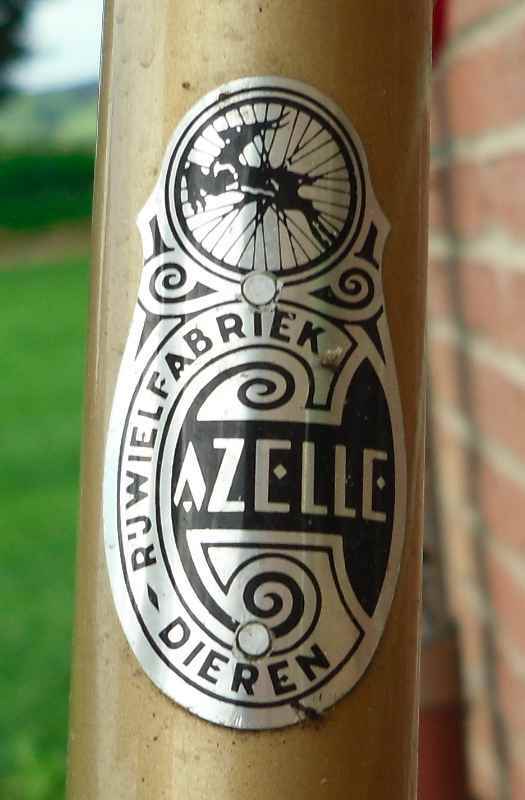 Still, we had a nice day riding a hilly 115km with the bunch one of which was the owner of the Gazelle. Thanks, boys. Hope to meet you soon. Rheda on Saturday, perhaps? In August 2003 my family and I were on holidays in St Valéry en Caux (76), France. 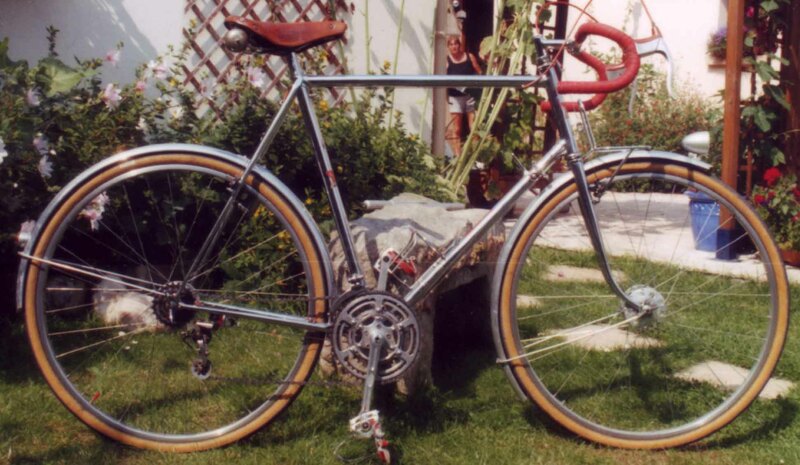 I can still remember vividly that on the way from the baker´s I saw a chromed bike being ridden by a young man. I hailed him, he stopped, and I nearly fell over backwards when I saw what the bike was. 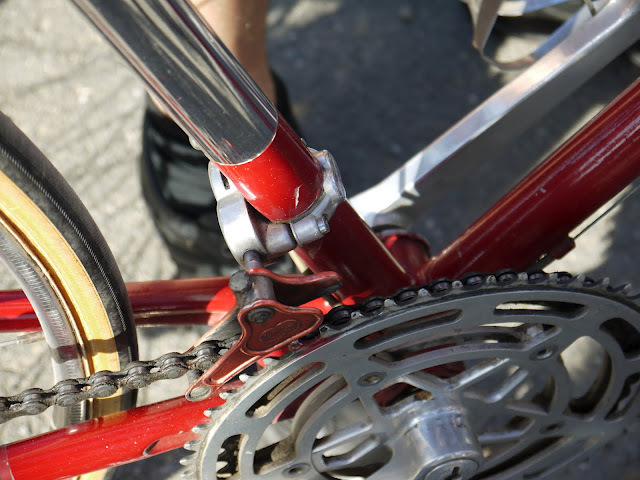 The young man had been given the bike by his Paris landlady, and I´m not sure that he knew what he had. He woudn´t sell it, he said, because it had been a gift. 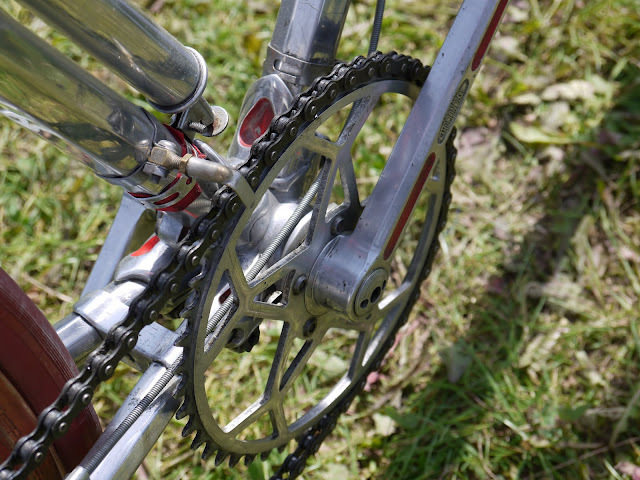 I was able to take some photographs of the bike because the rider was friendly enough to accompany me to our flat. 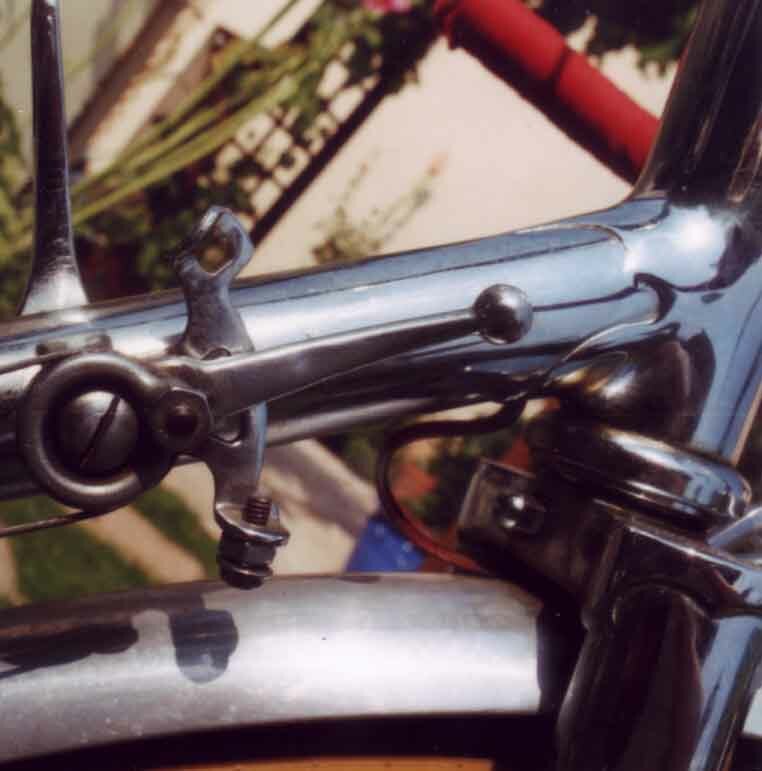 I think that judging from the state of the bike (headlamp, knurled screw on rear lamp, fraying brake cable) I witnessed te first stage of dilapidation and sincerely hope the bike made it and didn´t end up as a hack in Paris. 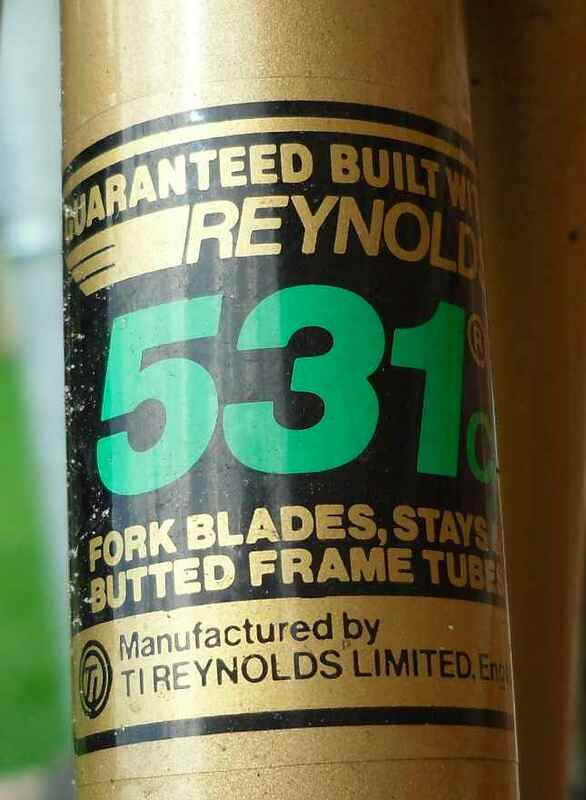 I photographed the frame number; perhaps this is a lead as to who owns it today or what happened to it. 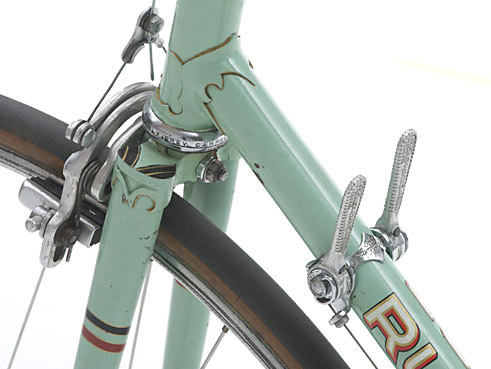 This must have been one of the best Singer Randonneuses in existence; the only item missing was the headlamp. 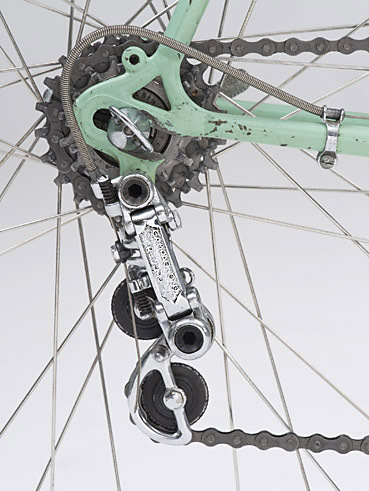 The use of the Nivex rear derailleur and the Stronglight 34 together with the Singer made brakes and front rack and the Singer modified hubs put it firmly in the top range of bicycles. 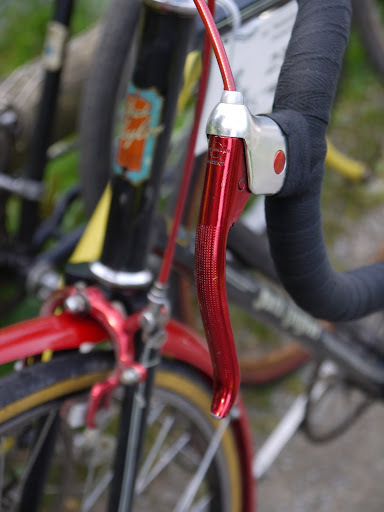 The lug tips are the thinnest you will find anywhere. Lastly, there´s a very fine AS Gillott. I think it´s my personal favourite from the whole lot. 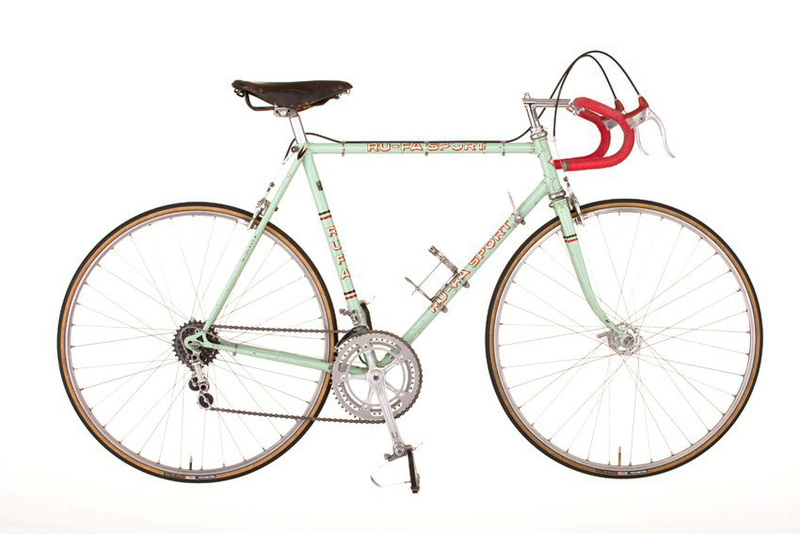 …or this, but in general it´s a very high quality, yet unpretentious bike with a purposeful air. 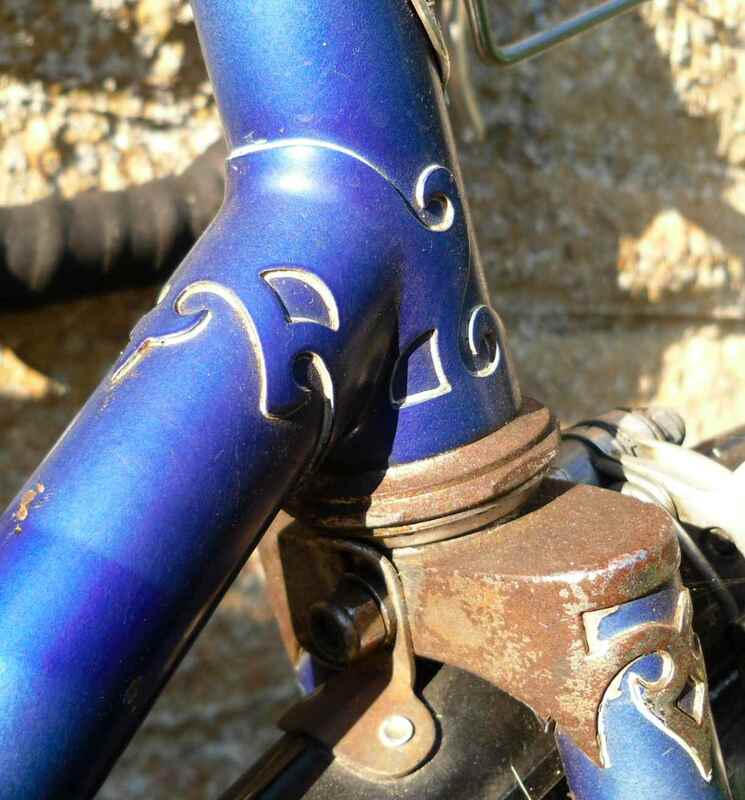 The only flamboyant bits are the lugs with the Gillott fleur de lys design.